We describe Ribo Mega-SEC, a powerful approach for the separation and biochemical analysis of mammalian polysomes and ribosomal subunits using Size Exclusion Chromatography and uHPLC. Using extracts from either cells, or tissues, polysomes can be separated within 15 min from sample injection to fraction collection. Ribo Mega-SEC shows translating ribosomes exist predominantly in polysome complexes in human cell lines and mouse liver tissue. Changes in polysomes are easily quantified between treatments, such as the cellular response to amino acid starvation. Ribo Mega-SEC is shown to provide an efficient, convenient and highly reproducible method for studying functional translation complexes. We show that Ribo Mega-SEC is readily combined with high-throughput MS-based proteomics to characterize proteins associated with polysomes and ribosomal subunits. It also facilitates isolation of complexes for electron microscopy and structural studies. The ribosome is a large RNA-protein complex, comprising four ribosomal RNAs (rRNAs) and >80 ribosomal proteins (RPs), which coordinates mRNA-templated protein synthesis. In human cells, the 80S ribosome has a molecular weight of ~4.3 MDa and a diameter of 250–300 Å (Khatter et al., 2015), which is larger than ribosomes in either yeast cells (~3.3 MDa), or in bacteria (~2.3 MDa) (Melnikov et al., 2012). During translation, multiple ribosomes can simultaneously engage the same mRNA to form a ‘polysome’ (Noll, 2008; Warner and Knopf, 2002; Warner et al., 1963). In mammalian cells, it is likely that most protein translation takes place on polysomes, rather than via mRNA translation by a single ribosome. The biochemical analysis of gene expression and regulation benefits from the ability to isolate and characterize these very large polysome structures. For example, polysome profiling has recently become a popular technique for the analysis of the ‘translatome’, that is the set of mRNA species being actively translated in polysomes (King and Gerber, 2016; Piccirillo et al., 2014). Polysome profiling involves the separation and isolation of polysomes away from free ribosomal subunits. This is typically achieved using a sucrose density gradient (SDG) step, prior to mRNA analysis with the enriched polysome fraction. SDG fractionation, a method introduced in the 1960s (Britten and Roberts, 1960; Warner et al., 1963), remains the near ubiquitous approach currently used to isolate and analyse polysomes. However, SDG analyses have limitations and can be time-consuming to set up and perform. This includes the long ultracentrifugation step (typically 3–20 hr) required, which can affect the structure of the ribosome and result in loss of weakly associated proteins (Simsek et al., 2017). SDG analysis also requires dedicated hardware for profile generation and fraction collection (Gandin et al., 2014). Multiple steps in the SDG workflow can also introduce sources of technical variation (e.g. gradient formation between centrifugation tubes, differences in starting position and collection of fractions etc), leading to an overall decrease in reproducibility and affecting resolution and accuracy (Ingolia et al., 2009). An alternative approach to SDG for isolation of polysomes and free ribosome subunits is to use affinity purification in extracts of cells expressing tagged RPs (Heiman et al., 2014; Inada et al., 2002; Simsek et al., 2017). However, polysomes and ribosomal subunits are co-isolated by this technique and cannot easily be separated. Moreover, the over-expression of RPs either with, or without tags, is known to induce formation of sub-complexes, because of inefficient assembly into ribosomes (Simsek et al., 2017). Unassembled ribosomal proteins are rapidly degraded by the ubiquitin-proteasome system (Lam et al., 2007; Sung et al., 2016a; Sung et al., 2016b; Warner, 1977). Arguably, the most efficient and reproducible modern method for fractionation-based biochemical analysis is provided by ultra High-Pressure Liquid Chromatography (uHPLC). This provides exceptional reproducibility, in comparison with other methods, from the use of electronically controlled autosamplers for sample injection and automatic fraction-collection components. Despite these potential advantages, uHPLC methods have not been developed for the effective chromatographic separation of polysomes and ribosome subunits (Maguire et al., 2008; Trauner et al., 2011). In particular, the very large size of polysomes has been viewed as being outside the effective separation range of size exclusion chromatography methods. To provide a more efficient and reproducible methodology that can facilitate the isolation of polysomes from mammalian cells and tissues, we have developed an uHPLC Size Exclusion Chromatography (SEC) method for studying very large intracellular structures and protein complexes (Mega-SEC). Here, we demonstrate the application of Mega-SEC to separate translation complexes extracted either from human cell lines, or from mouse liver tissue. We show efficient separation and collection of polysomes, 80S ribosomes, 60S and 40S ribosomal subunits using Ribo Mega-SEC uHPLC runs of ~15 min, with high reproducibility. We also combine Ribo Mega-SEC with downstream electron microscopy and high-throughput proteomic analysis to characterize isolated polysomes. To prepare lysates for polysome separations, we employed the standard method of polysome extraction used in traditional SDG analysis. The lysis buffer contained the standard reagents used to stabilize polysomes (cycloheximide, RNase inhibitors and Mg2+) (Klein et al., 2004; Ruan et al., 1997; Schneider-Poetsch et al., 2010; Shi et al., 2017; Strezoska et al., 2000). In addition, the buffer needed to contain a non-denaturing (either non-ionic or zwitterionic) detergent to solubilize the cell membranes. The non-ionic detergent Triton X-100 is the most widely employed in biochemical studies on ribosomes, including SDG analyses (Ingolia et al., 2012; Ingolia et al., 2009; Olsnes, 1970; Shi et al., 2017). However, Triton X-100 has a low critical micelle concentration (CMC), and is therefore not ideal for use in an SEC separation buffer. Heparin has been widely used when preparing extracts for polysome analyses but is not always essential and as shown below is best avoided for specific applications, such as MS-based analysis of isolated complexes. We therefore compared polysome profiles using SDG of lysates prepared in a buffer containing either Triton X-100, or the zwitterionic detergent CHAPS, which is also used for ribosome analysis and whose CMC is sufficiently high such that it can be effectively used in SEC separation buffers below its CMC (Hjelmeland, 1980). This showed a similar recovery of polysomes, including halfmers and ribosomal subunits from HeLa cells for both Triton X-100 and CHAPS (Figure 1—figure supplement 1). We therefore selected CHAPS for all subsequent experiments, based on its high CMC and because it is known to solubilize protein complexes without denaturation (Hjelmeland, 1980). We note that with the HeLa cells and culture conditions used here, which supported rapid cell growth, there was a high polysome:monosome (P/M) ratio, that is with relatively low levels of 80S ribosomes, as shown both by SDG and SEC analyses. We used these culture conditions in the experiments described below. To efficiently resolve polysomes and ribosomal subunits from cell extracts by SEC, we next optimized the choice of pore size for the SEC column and the maximum flow rate. First, we compared the SEC chromatograms of HeLa cell lysates separated using three different SEC columns with pore sizes of either 300, 1,000, or 2,000 Å, respectively, but with the same flow rate and salt concentration. This showed that only the largest pore size, that is 2,000 Å SEC column, successfully resolved complexes in the polysome size range (Figure 1—figure supplement 2). To characterize the fractionation profile of the 2,000 Å SEC column and assign the resulting peaks, we injected onto the SEC column either ribosomal subunits, or polysomes, that had been previously isolated by SDG (Figure 1A). Using a column flow rate of 0.2 ml/min, the 40S subunit, 60S subunit, 80S monosome and a mixture of polysomes elute separately at ~50 min, 46 min, 43 min and between 33 and 41 min, respectively (Figure 1B and C). This showed that the first peak eluted from the SEC column contained a mixture of different n-mer polysomes, the second peak contained 80S ribosomes, the third peak contained 60S subunits, the fourth peak contained 40S subunits and the bulk of smaller protein complexes eluted in a broad peak at the end of chromatogram (Figure 1D). This also showed that the peak corresponding to di-somes (two ribosomes per mRNA) was also detectable (Figure 1D). As the 80S peak was clearly separated from the polysome peak, a P/M ratio can be calculated, similar to that achieved by SDG (Figure 1D). We note that the use of a 1,000 Å SEC column provided a higher resolution separation between 60S and 40S ribosomal subunits, as well as between the 40S subunit and smaller protein complexes, but resulted in the 80S peak almost overlapping the polysome peak (Figure 1—figure supplement 2). Assignment of the peaks separated by a single 2,000 Å SEC column. (a) The HeLa cell lysate containing 100 μg of RNA was separated into 22 fractions by ultracentrifugation with a 10–45% sucrose density gradient with continuous monitoring of absorbance at 254 nm. (b) Fractions highlighted in blue in (a) were analyzed by SEC with a flow rate of 0.2 ml/min using the 2,000 Å SEC column. The chromatogram of smaller RNPs, 40S, 60S, or 80S monosome is shown. (c) Fractions highlighted in pink in (a) were analyzed by SEC with a flow rate of 0.2 ml/min using the 2,000 Å SEC column. The chromatogram of each polysome fraction is shown. (d) HeLa cell lysate containing 20 μg of RNA was analyzed by SEC using a flow rate of 0.2 ml/min on the 2,000 Å SEC column. The line in the chromatogram is the mean profile and the surrounding ribbon shows the standard deviation across the three technical replicates. The retention time is indicated on the x-axis and the UV absorbance at 260 nm is indicated on the y-axis. The P/M ratio from three technical replicates was also calculated and indicated. To achieve a higher resolution separation, extending from larger polysomes to smaller protein complexes, in a single shot analysis, we tested the use of two SEC columns connected in series using a column flow rate of 0.2 ml/min (Figure 1—figure supplement 3). This showed increased resolution of di-some and tri-some peaks, along with higher, n-mer polysome complexes and improved separation of both ribosomal subunits using two 2,000 Å SEC columns in series (Figure 1—figure supplement 3A). A similar improved separation of polysomes was achieved by the combination of a 1,000 Å SEC column and 2,000 Å SEC column in series, while this combination also provided more effective separation in the size range from 80S to smaller protein complexes (Figure 1—figure supplement 3B). Fractionation of extracts using two SEC columns run in series thus provides a flexible system for efficient separation across a large range of complexes of different sizes. Next, we optimized the column flow rate using a single 2,000 Å SEC column to minimize the total elution time required, while maintaining resolution. To do this, we chose to focus on the separation of the 80S peak from the polysome peak, given their close proximity. Using a column flow rate of 0.2 ml/min and a separation time of 60 min, the polysome peak and the 80S peak were clearly resolved (Figure 1D and Figure 1—figure supplement 4). However, at a flow rate of 1.0 ml/min, the 80S peak overlapped the polysome peak. As a compromise between analysis time and resolution, we therefore selected a flow rate of 0.8 ml/min for all subsequent experiments (Figure 1—figure supplement 4). Importantly, this SEC-based analysis was achieved in only 15 min, which contrasts with the hours required for SDG analysis. We also analyzed lysates individually extracted from four human cell lines (i.e. HeLa, U2OS, HCT116 p53+/+ and HCT116 p53 -/- cells) and showed that the elution profiles from the 2,000 Å SEC column were similar (Figure 1—figure supplement 5). We term this SEC-based uHPLC polysome fractionation method, ‘Ribo Mega-SEC’. To confirm that the first SEC peak contained polysomes, we compared the Ribo Mega-SEC chromatograms of control HeLa cell lysates with lysates that had been treated with EDTA. This treatment dissociates polysomes and 80S ribosomes into 60S and 40S subunits by chelating Mg2+ needed for complex formation (Klein et al., 2004; Nolan and Arnstein, 1969). Using SDG analysis, we confirmed this dissociation of polysomes and 80S ribosomes following EDTA treatment. We also observed the altered (earlier) elution of each dissociated 60S and 40S subunits due to the reduced subunit density resulting from EDTA treatment (Bengtson and Joazeiro, 2010; Blobel, 1971; Hamilton et al., 1971; Steitz et al., 1988) (Figure 2—figure supplement 1). 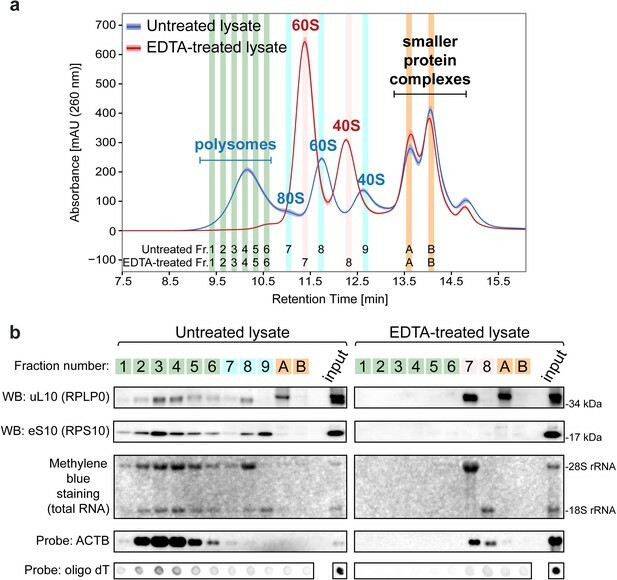 We analyzed these lysates by Ribo Mega-SEC, which showed that the polysome and 80S ribosome peaks both disappeared specifically from the EDTA-treated cell lysates. There was a simultaneous appearance of two new peaks, corresponding to the 60S and 40S subunits, respectively (Figure 2A). These fractions elute at slightly earlier times in the presence of EDTA, given that the density of each ribosomal subunit was decreased, and their effective size increased, following EDTA treatment, as noted above (Gesteland, 1966). Ribo Mega-SEC chromatograms of polysomes and free ribosomal subunits. (a) The UV chromatogram of HeLa cell lysates either untreated or treated with 30 mM EDTA (EDTA-treated) is shown. The line is the mean profile and the surrounding ribbon shows the standard deviation across the three biological replicates. The collected fractions (Fr.) are highlighted and numbered. The retention time is indicated on the x-axis and the UV absorbance of 260 nm is indicated on the y-axis. (b) The fractions were analyzed either by western blotting (WB) with the indicated primary antibodies, or by northern blotting with the probes indicated at the left. Methylene blue staining visualized rRNAs. Input: 20 μg of protein and 2 μg of RNA for Methylene blue staining and detecting ACTB mRNA or 250 ng of RNA for detecting polyA(+) mRNA, loaded for WB and NB, respectively. We next collected 48 fractions, ranging from polysomes to smaller protein complexes (Figure 2—figure supplement 2) and characterized the SEC peaks further, using both western and northern blotting to compare the compositions of specific fractions (Figure 2A and Figure 2—figure supplement 2). The polysome fractions (fractions 1–6) in the untreated control lysate contained RPs, that is, uL10 (RPLP0) and eS10 (RPS10), and 28S and 18S rRNAs. The polysome peak was also highly enriched in PolyA(+) mRNA. For example, beta actin mRNA (ACTB) was enriched specifically in the polysome peak (Figure 2B). Moreover, the 60S and 40S subunit peak fractions were also enriched in the corresponding 60S and 40S-specific RPs and rRNAs. As expected, these RP, rRNA and mRNA signals were significantly reduced in the peak polysome fractions from EDTA-treated cell lysates (Figure 2B). Following EDTA treatment, uL10 accumulated in two fractions; that is, a dissociated 60S subunit fraction (fraction 7) and the fraction not co-eluted with 28S rRNA (fraction A). 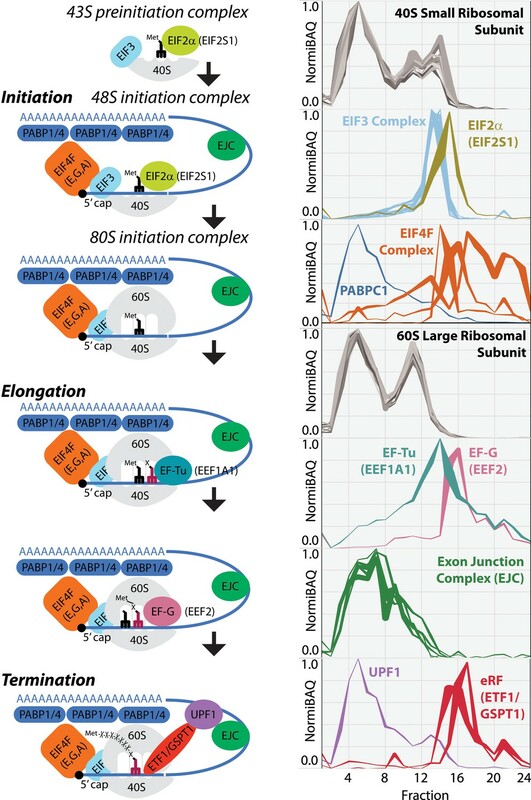 eS10 was neither detected in the dissociated 40S subunit in the fractions analysed by Ribo Mega-SEC, nor in the dissociated 40S fractions analysed by SDG, but was detected instead in the fractions containing smaller protein complexes (Figure 2B and Figure 2—figure supplements 1 and 3). This suggests that eS10 is one of the RPs released from ribosomal subunits after EDTA treatment, as reported previously for the 5S RNP (Blobel, 1971; Steitz et al., 1988). We next examined the stability and activity of polysomes obtained by Ribo Mega-SEC, during sequential separations and high salt treatment. First, we tested polysome stability over time by taking three fractions in the polysome peak (highlighted fractions 1–3 in Figure 3A) and analyzing each fraction individually, both by a second round of Ribo Mega-SEC and by SDG analysis (Figure 3B). Earlier SEC fractions migrated in the heavier polysome region (>5 ribosomes per polysome) by SDG, and later SEC fractions migrated in the lighter polysome region (~3 ribosomes per polysome) by SDG. In addition, no dissociated ribosomal subunits from the Ribo Mega-SEC purified polysomes were detected by either the SEC, or SDG approaches. This demonstrates that the polysomes separated by Ribo Mega-SEC are stable and remain intact (Figure 3B). Stability of polysomes isolated by Ribo Mega-SEC. (a) Fractions analyzed by the subsequent SDG analysis are numbered and highlighted in colors (yellow, blue, and green) in the Ribo Mega-SEC profile of HeLa cell lysate. Fractions analyzed by the subsequent EM analysis are termed as ‘EM a’ and ‘EM b’. The retention time is indicated on the x-axis and the UV absorbance of 260 nm is indicated on the y-axis. (b) Each fraction in (a) was analyzed by ultracentrifugation with a 10% to 45% sucrose density gradient. The regions where ribosomal subunits (40S, 60S and 80S) and the number of ribosomes (2 s, 3 s, 4 s, 5 s and >6 s) in polysomes sediment are labeled. (c) Fractions labeled as ‘EM a’ and ‘EM b’ in (a) were analyzed by EM analysis. Scale bar showing 100 nm is indicated at the bottom left in each image. (d) Each fraction in Figure 3—figure supplement 2 was incubated with either unlabelled puromycin (Negative control), or biotin-labelled puromycin. The biotin-puromycylated nascent polypeptide chains and eL28 (RPL28) were detected by WB with streptavidin and anti-RPL28 antibody. *endogenous biotinylated proteins. Input: 20 μg of protein in lysates incubated with either unlabeled puromycin, or biotin-labeled puromycin was loaded. 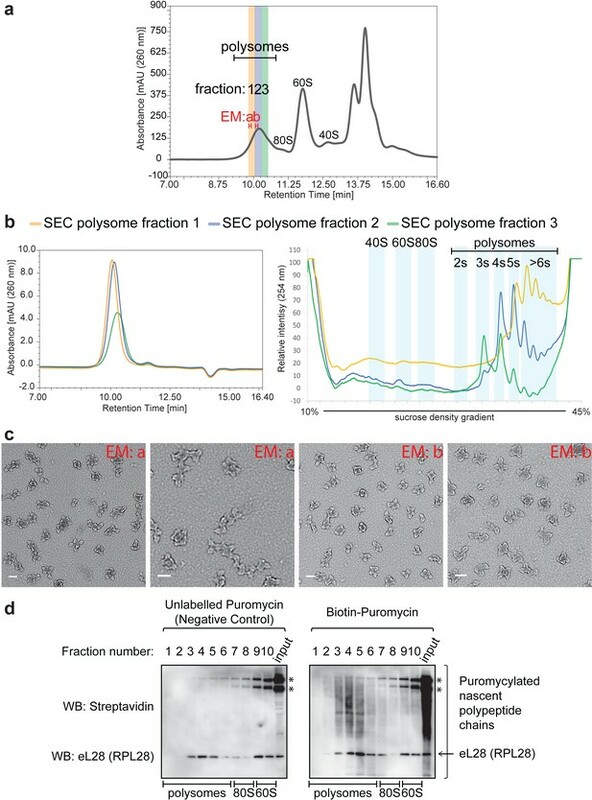 We also analyzed two sets of polysome fractions isolated by Ribo Mega-SEC using electron microscopy (EM); that is (a) material from earlier eluting polysome fractions (EM: a in Figure 3A) and (b) material from an intermediate eluting polysome fraction (EM: b in Figure 3A). The complexes from each fraction were applied directly onto an EM grid, without dialysis, and viewed in a JEOL 2010F with FEG (Field Emission Gun) electron microscope in TEM mode at a nominal magnification of 40,000X. This EM analysis showed that earlier eluting SEC fractions contain larger polysomes, with elongated and heterogeneous shapes (Figure 3C). These may correspond to ‘HMW and/or [HMW]n (n = 2) polysomes (i.e. assemblies of polysomes)’ (Viero et al., 2015). In contrast, polysomes composed of four ribosomes accounted for a major portion of the intermediate eluting SEC fraction and their shapes were more round and homogeneous (Figure 3B and C). These may correspond to ‘rounded’ polysomes (Viero et al., 2015). In addition, some larger polysomes were also found in this fraction, which is consistent with the data obtained by SDG analyses above (Figure 3B and C). In a second round of stability tests, we examined SDG and SEC profiles of HeLa cell extracts prepared and separated under either normal salt concentrations, or high-salt concentrations. Using SDG analysis, we detected a decrease in intensity of the 80S peak and accumulation of free 60S and 40S subunits. This is likely due to vacant 80S couples dissociating into free subunits in the high-salt buffer (Figure 3—figure supplement 1A) (Martin and Hartwell, 1970; van den Elzen et al., 2014). We also detected a reduction of both the amount and resolution of polysome peaks in the SDG separations due to the increase of salt concentration (Figure 3—figure supplement 1A) (Strnadova et al., 2015). We then analyzed these same lysates by SEC, which also showed a similar decrease of polysome peak abundance (Figure 3—figure supplement 1B). Based on our observations that, under high-salt concentrations, (i) each peak analyzed by SDG elutes earlier and (ii) each peak analyzed by SEC elutes later, we infer that high salt reduces the size of ribosomal subunits, probably because of a loss of ribosomal proteins and/or proteins associated with ribosomal subunits. Next, we examined whether the ribosomes in polysome fractions separated by Ribo Mega-SEC retained peptidyl transferase activity, which would provide a clear indicator of stability and retention of function after fractionation. To do this, we employed in vitro puromycin labeling (Figure 3D and Figure 3—figure supplement 2) (Aviner et al., 2013). As was true for all experiments in this study, we used lysates from cells treated with cycloheximide for this analysis. This was possible because short-term treatment of cells with cycloheximide has no significant effect on nascent polypeptide chain puromycylation (David et al., 2012). We detected nascent polypeptide chains linked with biotin-labeled puromycin specifically in the polysome fractions (Figure 3D). A streptavidin-HRP signal was not observed in the 60S subunit fractions, or when extracts were treated with unlabeled-puromycin (negative control) (Figure 3D). These data show that, using Ribo Mega-SEC, both intact and translation-active polysomes can be resolved from cell extracts efficiently (~11 min after injection). An important distinction between density-gradient-based fractionation and uHPLC-based separation is the inherent improvement in reproducibility through the use of automated injection and fraction-collection systems. Many fields, including biochemistry and pharmacology, rely on the reproducible retention times and quantitation provided by automated uHPLC systems. We have evaluated reproducibility here for Ribo Mega-SEC through the analysis of three biological replicates of either untreated, or EDTA-treated, cell lysates. Statistical comparison of these chromatograms showed very high Pearson correlation coefficients of ~0.99 across the biological replicates (Figure 4A and Figure 4—figure supplement 1). 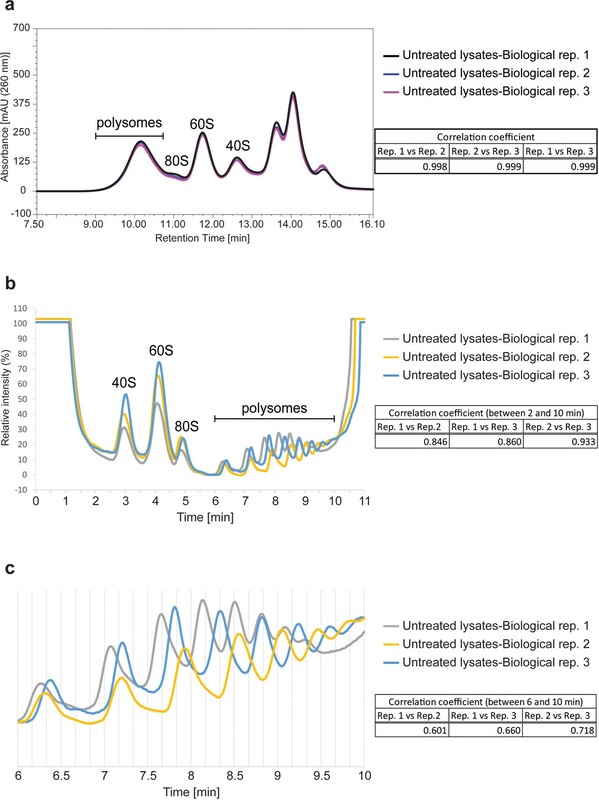 Polysome profiles generated by SDG analysis from three biological replicates of untreated cell lysates also showed high Pearson correlation coefficients, but consistently lower than those from Ribo Mega-SEC (Figure 4B). Moreover, we found an ~5 to 10 s difference (equivalent to 80 μl to 160 μl difference) between the SDG replicates in the polysome region, possibly due to the variability in density of the sucrose gradients in each tube (Figure 4C). These data show that the Ribo Mega-SEC approach is highly reproducible and compares favourably in this regard with polysome isolation using SDG. Reproducibility of Ribo Mega-SEC and SDG analysis. (a) The UV chromatograms of Ribo Mega-SEC from the three biological replicates of untreated cell lysates were showed. The retention time is indicated on the x-axis and the UV absorbance of 260 nm is indicated on the y-axis. The Pearson correlation coefficient calculated for the three biological replicates between 8.0 min and 16.1 min (replicate 1 versus replicate 2, replicate 1 versus replicate 3, and replicate 2 versus replicate 3) was also indicated at the right. (b) The polysome profiles of SDG analysis from the three biological replicates of untreated cell lysates are shown. The time is indicated on the x-axis and the UV absorbance of 254 nm is indicated on the y-axis. The Pearson correlation coefficient calculated for the three biological replicates between 2.0 min and 10.0 min (replicate 1 versus replicate 2, replicate 1 versus replicate 3, and replicate 2 versus replicate 3) is also indicated at the right. (c) The polysome region from 6.0 min to 10.0 min in (b) was expanded and the Pearson correlation coefficient was calculated between these time points. We next took advantage of the optimized Ribo Mega-SEC method to examine whether we detect differences in the relative levels of polysomes and ribosomal subunits when extracts are analyzed from HeLa cells responding to growth under conditions of amino acid starvation. This showed dramatically decreased polysome levels in the lysates from amino acid starved cells, with a corresponding distinct increase in the peaks for 80S ribosome, and 60S and 40S subunits, consistent with previous reports (Caldarola et al., 2004) (Figure 5A). Quantitation of the peak areas and the P/M ratio confirmed the expected global reduction of translation in response to amino acid starvation (Figure 5B). Ribo Mega-SEC profile with or without amino acid starvation. (a) Sixteen fractions separated from the lysates of HeLa cells grown in EBSS, either with (+AA), or without (-AA), exogenous amino acids for 2 hr, were collected. The line is the mean profile and the surrounding ribbon shows the standard deviation across the three biological replicates. The collected fractions (Fr.) are highlighted and numbered. The retention time is indicated on the x-axis and the UV absorbance of 260 nm is indicated on the y-axis. (b) The area of each peak of either polysomes, or free ribosomal subunits, was quantified and graphed. The values are mean (±standard deviation) of three biological replicates. *p<0.05, **p<0.01. The P/M ratio from three biological replicates was also calculated and indicated. (c) The fractions were analyzed by northern blotting with the probes indicated at the left. Input: 2 μg of RNA from the lysate was loaded. Quantifications of the fraction (in percent of the total amount) of uL23 and ACTB mRNAs found in the polysome fractions were performed and the graphs are shown at the bottom. The values are mean (±standard deviation) of three biological replicates. **p<0.01. Translation of 5’ TOP mRNAs has been reported to be repressed by amino acid starvation, due to the release of this class of mRNAs from polysomes (Damgaard and Lykke-Andersen, 2011). Our data here using Ribo Mega-SEC support these observations on the loss of 5’ TOP mRNAs from polysomes after starvation. Thus, we see that the uL23 (RPL23a) mRNA, a 5’ TOP mRNA, was specifically decreased in the polysome fractions of extracts isolated from amino acid starved cells, while the ACTB mRNA mostly remained associated with polysomes, although we detected a small portion of ACTB mRNA also redistributed into the ribosomal subunit fractions (Figure 5C). 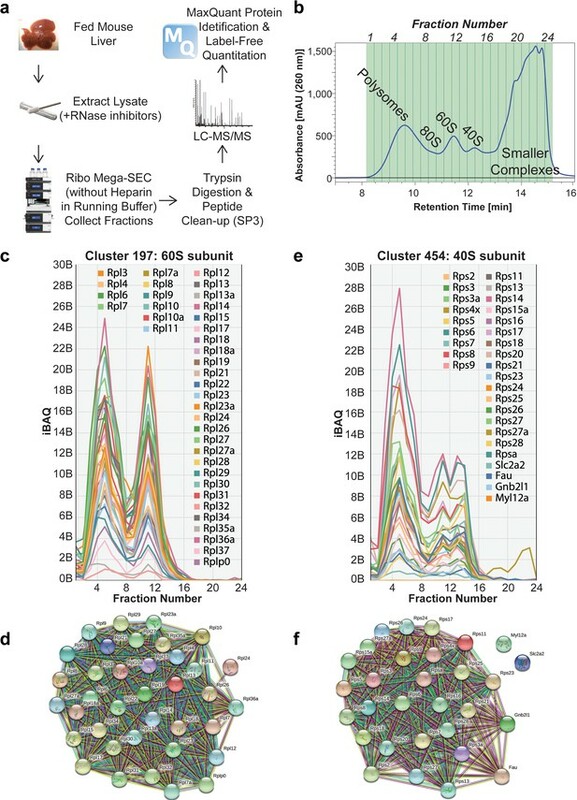 These data indicate that the Ribo Mega-SEC approach is well suited for use in studies to characterize changes in translational activity in cells, either under different growth conditions, or in response to drugs, physical, or genetic perturbations. The previous examples involved analysis of polysomes in extracts isolated from human cell lines. We also evaluated how effectively Ribo Mega-SEC can be used to analyse polysomes in extracts prepared from mammalian tissue samples. In addition, we wished to test whether this approach can be used to perform MS-based proteomic analyses on the isolated polysome fractions. To do this, we applied Ribo Mega-SEC to analyze the proteins associated with polysomes and ribosomal subunits in mouse liver tissue. Extracts were prepared from mouse liver and fractionated by SEC, which showed a similar pattern of polysome separation as seen with extracts prepared from HeLa cells, also with very high Pearson correlation coefficients (~0.99) across biological replicates (Figure 6—figure supplement 1). This showed that translation complexes in liver tissue are mostly associated with polysomes, rather than 80S monosomes. Next, we optimized the SEC running buffer to facilitate downstream proteomic analysis of the fractionated polysomes. For this, we found it was important to omit heparin from the SEC running buffer, as it interferes with MS analysis and is difficult to remove after SEC fractionation using conventional proteomics sample preparation techniques. We confirmed that the separation profiles were similar using SEC running buffer either with, or without, heparin, and also confirmed that polysomes and ribosomal subunits remained intact under both conditions (Figure 6—figure supplement 2). We then collected 24 SEC fractions, spanning the separation range from polysomes to smaller complexes (Figure 6A and B). Each fraction was digested with trypsin and the resulting peptides cleaned to remove the buffer components, prior to LC-MS/MS analysis on a QExactive plus mass spectrometer (Figure 6A) (Larance et al., 2016; Larance et al., 2015; Ly et al., 2015; Ly et al., 2017). Proteomic analysis of Ribo Mega-SEC fractions from mouse liver tissue. (a) Workflow for Ribo Mega-SEC analysis of mouse liver tissue and LC-MS/MS methodology. (b) Ribo Mega-SEC profile of mouse liver tissue. The collected fractions are highlighted and numbered at the top of the chromatogram. The retention time is indicated on the x-axis and the UV absorbance of 260 nm is indicated on the y-axis. (c) Ribo Mega-SEC elution profiles for all proteins identified in example cluster 197 were displayed as line graphs with the mean iBAQ intensity (y-axis) plotted against each elution fraction (x-axis). (d) STRING interaction network for proteins identified in example cluster 197. (e) Ribo Mega-SEC elution profiles for all proteins identified in example cluster 454 were displayed as line graphs with the mean iBAQ intensity (y-axis) plotted against each elution fraction (x-axis). (f) STRING interaction network for proteins identified in example cluster 454. The data from two biological replicates yielded >58,800 unique peptides, which were mapped to 5,158 protein groups, each identified with two or more peptides per protein. We used iBAQ intensity for label-free quantitation to estimate protein abundance and compare protein abundance across the fractions (Figure 6C and E and Figure 7) (Larance et al., 2016). Schematic image of whole translation process highlighted with the identified proteins in mouse liver tissue. Ribo Mega-SEC elution profiles for 40S small ribosomal subunit, EIF2alpha, EIF3 complex, EIF4F complex, PABPC1, 60S large ribosomal subunit, EF-Tu, EF-G, exon junction complex (EJC), UPF1, and eRF are displayed as line graphs with the mean normalized iBAQ intensity ± the standard deviation (y-axis) plotted against each elution fraction (x-axis). We further analyzed the data to identify both polysome-associated and ribosomal subunit-associated proteins, using hierarchical clustering across the 24 fractions. To determine the number of protein clusters required, we tested the generation of 1–2,000 separate clusters from our dataset and calculated the mean Pearson correlation within each cluster (Figure 6—figure supplement 3A and B) (Kirkwood et al., 2013). We picked 400 protein clusters as an optimum, because this showed a high mean correlation coefficient (~0.95) for each cluster, while minimizing the subdivision of known protein complexes between different clusters (Figure 6—figure supplement 3A, Supplementary file 1). The large and small ribosomal subunit proteins predominantly clustered separately, with cluster 197 containing 39 proteins from the 60S subunit (Figure 6C and D). Cluster 454 contained 30 proteins, mostly from the 40S subunit, including the known accessory proteins Gnb2l1 (Link et al., 1999) (Figure 6E and F). Moreover, two proteins (Slc2a2 and Myl12a) were observed in the 40S cluster as candidate 40S-associated factors (Figure 6E and F). Using mouse liver tissue, we detected in total 78 mouse RPs across the fractions, of which 33 were small ribosomal subunit proteins and detected in the polysomes/80S and 40S subunit fractions. The other 45 were large ribosomal subunit proteins and detected in polysomes/80S and 60S subunit fractions (Figure 7) (Nakao et al., 2004). We also detected multiple translation initiation factors (eIFs), which were mainly in 40S fractions, forming the 48S initiation complex. We also found that Poly(A) binding proteins 1 and 4 (PABPC1, PABPC4) were enriched in the polysome fractions, with a small portion in the fractions containing smaller protein complexes (Schäffler et al., 2010). Proteins from the Exon Junction Complex (EJC - EIF4A3, RBM8A, RNPS1, MAGOHB, CASC3) were detected specifically in the polysome fractions and ribosomal subunit fractions, consistent with a previous report showing that EJC proteins eluted in the void volume of a gel filtration column (>2 MDa) (Singh et al., 2012). We also detected UPF1, a protein involved in nonsense-mediated decay of mRNA, mainly in polysome fractions, as well as in 40S fractions (Min et al., 2013). In addition, we detected translation elongation factors (eEFs) and translation termination factors (eRFs), which were present in polysomes and 80S fractions, although the majority of these proteins were in the SEC fractions containing smaller complexes (Figure 7), consistent with previous studies (Eyler et al., 2013; Sivan et al., 2011; Sivan et al., 2007). In summary, we conclude that Ribo Mega-SEC provides an efficient and flexible approach for isolating polysomes and ribosomal subunits that is compatible with downstream proteomic analysis on the isolated material. The method can be applied to study extracts from both cell lines and tissue samples and thereby provides a convenient new technology for characterizing polysome-associated proteins in cells under different growth and response conditions. To maximize community access to the entire dataset described in this study, the proteomics data, including raw MS files and MaxQuant-generated output, are freely available via the ProteomeXchange PRIDE repository with the data set identifier PXD008913. The Ribo Mega-SEC method described here provides a powerful new approach for enhancing the analysis of gene expression at the level of active translation complexes. We have shown that Ribo Mega-SEC provides a rapid and reproducible method for the isolation of polysomes and ribosomal subunits using uHPLC and is therefore an accessible alternative to the use of conventional SDG methods. In particular, the Ribo Mega-SEC approach is well suited to broadening access for researchers to analyze polysomes more widely in future studies on regulatory responses and disease mechanisms in mammalian cells and tissues. Polysome analysis is currently performed almost exclusively using SDGs. This is a well-established and effective method but also is widely recognized to have some limitations. For example, it is comparatively slow to carry out, involving a long ultracentrifugation step, and requires specialist equipment and expertise to use reliably. In addition, the multiple handling steps involved in setting up SDG analyses, together with the subsequent fraction collection and analysis steps, all introduce potential sources of experimental and technical variation that overall can reduce detailed reproducibility of gradient profiles between SDG experiments, as previously recognised (Ingolia et al., 2009). Another practical issue arises from the sensitivity of the detectors commonly used for analyzing SDG fractions and the requirement for establishing a consistent signal to noise baseline. This can potentially complicate the accurate comparison of SDG polysome profiles between experiments, without additional normalization steps, particularly when analyzing samples with low RNA amounts (Figure 2—figure supplement 1). Moreover, due to the high viscosity of the sucrose solution used for SDG, either further purification and/or dialysis is needed if the separated polysomes and ribosome subunits are to be used for subsequent experiments, such as Cryo-EM analysis (Grassucci et al., 2007). In combination, all these issues outlined above have limited the wider application of polysome analyses for many types of gene expression studies addressing regulatory responses and disease mechanisms in human cells and model organisms. The Ribo Mega-SEC approach we introduce here overcomes a number of the limitations associated with polysome analysis by SDG for studies on mammalian cells and tissues. For example, Ribo Mega-SEC involves a single, rapid uHPLC step; the process from injecting lysate to collecting fractions can be completed within 15 min, while keeping the sample at 4–5°C through all steps. This has obvious benefits for biochemical analyses. Moreover, the use of uHPLC provides exceptional reproducibility of retention time between experiments, due to the combination of automated, highly accurate sample injection, an automatic UV signal zeroing at the start of each sample run and high quality, robust components (pumps/valves) and columns. We also demonstrate that Ribo Mega-SEC can be used in conjunction with physiological buffers that are compatible with most subsequent analytical techniques, including MS-based proteomics, EM analysis and biochemical assays, for example translation activity assays (Figures 3, 6 and 7). Ribo Mega-SEC profiles can thus reflect the physiological status of polysomes and ribosomes in vivo, and the data they provide indicate that mRNA translation occurs predominantly in polysome complexes (as compared to 80S ‘monosome’ complexes) (Aspden et al., 2014; Noll, 2008; Warner and Knopf, 2002) in mouse liver and in human cancer cell lines. Using a single uHPLC instrument, as many as 48 different samples can be automatically separated and fractionated by Ribo Mega-SEC within 16 hr. Ribo Mega-SEC is therefore suited for high-throughput experiments and for combining with techniques such as RNA-Seq analysis and proteomic analysis (Figures 6 and 7). We have also shown that the separate fractions in a single polysome peak have different sized n-mer polysomes (Figures 1 and 3), and these fractions as well as the ribosomal subunit fractions can also be re-analyzed and further separated by a second round of SEC. We note that, thanks to the rapid separation provided by uHPLC, even performing two sequential rounds of Ribo Mega-SEC analysis to achieve higher resolution separation of both different sizes of polysomes and ribosomal subunits can be achieved comfortably within 30–45 min total analysis time. This is faster than performing a single round of SDG fractionation, as well as delivering the polysomes and ribosomal subunits already in a physiological buffer. The specific setup and conditions used for Ribo Mega-SEC fractionation can be customized in different experiments to optimize the analysis depending on whether speed, or resolution is most critical. For example, by employing a lower flow rate (e.g. 0.2 ml/min), higher resolution separation of large complexes can be achieved (Figure 1—figure supplement 4). 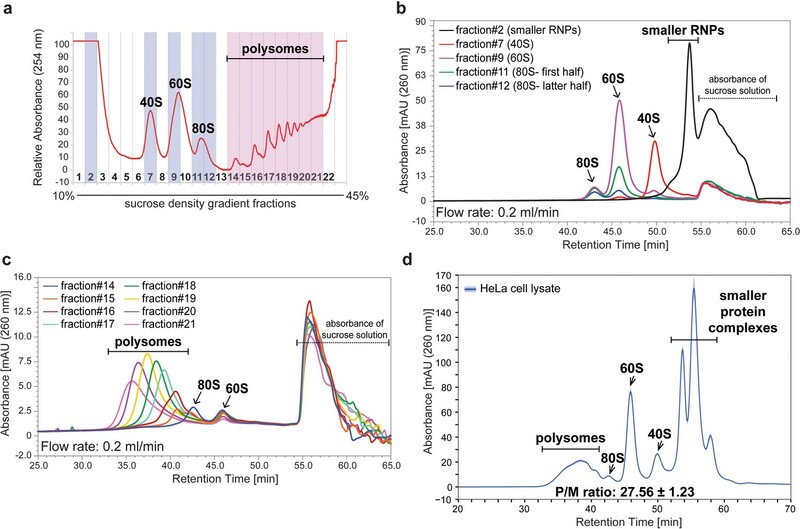 Alternatively, employing two SEC columns connected in series, with a flow rate of 0.2 ml/min, provides a higher resolution separation of complexes from larger polysomes to smaller protein complexes in a single shot SEC analysis (Figure 1—figure supplement 3). In this case, the trade-off is that a longer separation time is required. For many experiments, therefore, using a single SEC column with a faster 0.8 ml/min flow rate, is optimal. The pore size of the SEC column can also be varied to help customize separation for specific applications. For example, we show that using a 1,000 Å SEC column with a flow rate of 0.2 ml/min improves the separation of 60S and 40S ribosomal subunits as well as 40S subunits from smaller protein complexes (Figure 1—figure supplement 2). This can be helpful for studying translation initiation steps. There is a clear scope for enhancing further the specific application of Mega-SEC fractionation methods based upon varying these parameters such as pore size, buffer, number and type of columns used in series and flow rates etc. Polysome profiling is now a popular technique. It is used, for example, to assess changes in translation efficiency by examining a pool of efficiently translated mRNAs associated with more than three ribosomes, referred to as a ‘heavy polysome’, typically involving isolation of the heavy polysome by SDG (King and Gerber, 2016; Piccirillo et al., 2014). Ribosome profiling is another popular technique used to assess the changes in translation efficiency by identifying and quantifying the ribosome-protected fragments by RNAseq (Ingolia et al., 2012; Ingolia et al., 2009). However, polysome profiling offers technical advantages, because ribosome profiling can be biased toward the identification of abundant mRNAs that show large changes (Masvidal et al., 2017). A recent report has described an efficient method to enrich heavy polysomes in ~1 ml, using a non-linear sucrose gradient, which helps to overcome one of the issues when larger volumes are collected across several polysome fractions after a typical SDG analysis. Nonetheless, this method still involves the preparation of sucrose gradients and a long ultracentrifugation step (Liang et al., 2018). The Ribo Mega-SEC approach shows that the heavy polysomes are enriched in the first half of the polysome peak, eluted between 9 and 10.25 min after injecting the lysates (Figure 3A–C), which is equivalent to ~1 ml in volume. However, it is thought that the bulk of 80S monosomes are involved in translation elongation. Therefore, pre-selection of heavy polysomes may bias the interpretation of an in vivo translation activity (Heyer and Moore, 2016). A more comprehensive picture of the translational flux in vivo may be provided therefore by isolating and quantifying mRNAs from fractions containing both polysomes and the 80S monosome, which can be collected within ~11.25 min of starting analysis using the Ribo Mega-SEC method (Figure 2A). We therefore suggest that Ribo Mega-SEC offers significant technical and practical advantages for future studies on post-transcriptional gene expression in mammalian cells and tissues involving the isolation of active translation complexes. While we have demonstrated clear advantages provided by Ribo Mega-SEC, no single method is best suited to every situation and we acknowledge two potential features of the Ribo Mega-SEC method that may be relevant to whether it is used for specific applications. The first is that polysomes are predominantly eluted by a single column SEC in a single major peak, albeit distributed across multiple fractions. We show here that this resolution of polysomes can be improved by running two SEC columns in series in a single shot experiment. Nonetheless, if the separation of different higher order n-mer polysome species is critical for a specific experiment, it may still be preferable to perform SDG analysis, either instead of, or in addition to, Ribo Mega-SEC. However, while analysis of mRNAs with varying numbers of ribosomes is reported for ‘TrIP-Seq’ or ‘Poly-Ribo-Seq’ using SDG (Aspden et al., 2014; Floor and Doudna, 2016), our analyses indicate that the isolation of different polysome size classes by SDG might underestimate the true level of cross-contamination between fractions because of the increased baseline in the polysome peak region, which indicates that polysome ‘peaks’ are not homogeneous. Inevitably, in addition to the major species in the peak, they also contain mixtures of polysomes of different sizes. A second issue we have identified is the assessment of vacant 80S couples by high-salt treatment (Figure 3—figure supplement 1). This arises because SEC separation is sensitive to changes in mobile phase components, such as salts. However, we note this use of high-salt extracts represents a special case that is not involved in most routine studies of polysomes in cells and tissues. Instead, fractionation using high salt may be most relevant to specific biochemical studies, for example on the detailed mechanism of ribosome assembly. Therefore, the choice of whether best to use either conventional SDG methods, or the new Ribo Mega-SEC method, can be made by researchers in light of the required experimental design and mindful of the specific pros and cons of each approach. In many cases, it may be sensible to analyze extracts using both methods, as illustrated here. In summary, we have demonstrated that the Ribo Mega-SEC method provides an efficient and powerful new approach for the biochemical analysis of mammalian polysomes and ribosome subunits, isolated from extracts of either cultured cell lines, or tissues. Furthermore, we note that this approach using large pore size (2,000 Å) SEC columns and uHPLC chromatography, potentially has many additional applications beyond the field of protein translation. For example, the ability to efficiently and rapidly separate very large structures by Mega-SEC could also be applied to the purification and biochemical analysis of other large sub-cellular complexes, viral particles and secreted vesicles such as exosomes. A particular advantage of using SEC is that the complexes are isolated rapidly and in buffers suitable for performing biochemical assays immediately on the isolated material without the need for further purification. BioBasic SEC-300, SEC-1,000 and SEC-2,000 LC Columns were from Thermo Fisher Scientific (We note that the SEC-2,000 LC Column was not commercially available when these experiments were carried out). Agilent Bio SEC-5 2,000 Å was from Agilent. CHAPS (Sol-Grade) was from Anatrace. DMEM (high glucose, pyruvate; 41966–029), Fetal bovine serum (FBS), dialyzed FBS, EBSS (with calcium, magnesium and phenol red), MEM amino acids solution (50X), MEM non-essential amino acids solution (100X), MEM vitamin solution (100X), l-glutamine (200 mM), Penicillin-Streptomycin, SUPERase In RNase inhibitor, TRIzolLS reagent, BCA protein assay kit, EZQ protein quantitation kit, CBQCA protein quantitation kit, and Chemiluminescent Nucleic Acid Detection Module kit were from Thermo Fisher Scientific. Complete EDTA-free Protease inhibitor was from Roche. 0.45 μm Ultrafree-MC HV centrifugal filter units and Stericup filter units were from Merck Millipore. PVDF membrane and Hybond-N +nylon membrane were from GE Healthcare Life Sciences. IMMUNO SHOT was from Cosmo Bio. Biotin-dC-Puromycin was from Jena Bioscience. Any other standard laboratory chemicals were obtained from either Sigma, or VWR. HeLa (RRID: CVCL_0030), HCT116 p53+/+ (RRID: CVCL_0291), and U2OS (RRID: CVCL_0042) cells were purchased from ATCC. HCT116 p53-/- cells (RRID: CVCL_S744) was purchased from Horizon. Cell lines were tested negative for mycoplasma contamination. Cells were maintained in DMEM supplemented with 10% FBS, penicillin (100 U/ml) and streptomycin (0.1 mg/ml) at 37°C and 5% CO2. For the starvation experiments, HeLa cells were washed twice with PBS and incubated for 2 hr in EBSS supplemented with 10% dialyzed FBS, vitamins, glucose (4.5 g/L) and sodium pyruvate, either with, or without, a mixture of amino acids (MEM amino acids solution, NEAA, and glutamine), at almost the same concentration of DMEM. Cells were treated with 50 μg/ml cycloheximide to maintain polysome stability for 5 min under 37°C and 5% CO2 before harvest. C57BL/6J male mice were purchased from Australian BioResources (Moss Vale, Australia) at 7 weeks of age and kept at 22°C on a 12 hr light/dark cycle with free access to food (CHOW - 13% calories from fat, 22% calories from protein, and 65% calories from carbohydrate, 3.1 kcal/g; Gordon's Specialty Stock Feeds, Yanderra, Australia) and water. Mice were sacrificed in the fed state (9am) at 10–12 weeks of age by cervical dislocation, and the liver tissues were quickly excised and freeze-clamped in liquid nitrogen. The tissues were stored at −80°C before analysis. All experiments were carried out with the approval of the University of Sydney Animal Ethics Committee (2016/1096), following guidelines issued by the National Health and Medical Research Council of Australia. Cells in two 10 cm dishes (80% confluency) were grown as described above, washed with ice-cold PBS containing 50 μg/ml cycloheximide, scraped on ice, collected by centrifugation, lysed by vortexing for 10 s in 300 μl of polysome extraction buffer (20 mM Hepes-NaOH (pH 7.4), 130 mM NaCl, 10 mM MgCl2, 1% CHAPS, 0.2 mg/ml heparin, 2.5 mM DTT, 50 μg/ml cycloheximide, 20 U SUPERase In RNase inhibitor, cOmplete EDTA-free Protease inhibitor) or in polysome extraction buffer containing 0.5 M NaCl, incubated for 15 min on ice, and centrifuged at 17,000 g for 10 min (all centrifugations at 4°C). Frozen liver (typically 100 mg wet weight) was homogenized in 2 ml of polysome extraction buffer using a glass dounce tissue grinder with 10 strokes. After clarification by 2,500 g for 10 min followed by removal of the lipid layer on the top of the supernatants, the lysates were mixed with heparin (1 mg/ml) and centrifuged at 16,000 g for 10 min. Supernatants from either cells, or liver tissue, were filtered through 0.45 μm Ultrafree-MC HV centrifugal filter units by 12,000 g for 2 min, and protein and RNA amounts in the filtrates were quantified by BCA protein assays and BioPhotometer (Eppendorf), respectively. To dissociate ribosomes, the filtrates were treated with 30 mM EDTA and filtered again before injecting to SEC. Columns employed were all of dimensions 7.8 × 300 mm with 5 μm particles and included Thermo BioBasic SEC 300 Å, 1,000 Å, or 2,000 Å columns, or Agilent Bio SEC-5 2,000 Å columns. Using a Dionex Ultimate 3,000 Bio-RS uHPLC system (Thermo Fisher Scientific), each SEC column was equilibrated with two column volumes (CV) of filtered SEC buffer (20 mM Hepes-NaOH (pH 7.4), 60 mM NaCl, 10 mM MgCl2, 0.3% CHAPS, 0.2 mg/ml heparin, 2.5 mM DTT) (all column conditioning and separation at 5°C) and 100 μl of 10 mg/ ml of filtered bovine serum albumin (BSA) solution diluted by PBS was injected once to block the sites for non-specific interactions. After monitoring the column condition by injecting standards, including 10 μl of 10 mg/ml BSA solution and 25 μl of HyperLadder 1 kb (BIOLINE), cell lysates were injected onto a column. For the separation of EDTA-treated cell lysates, SEC buffer containing 30 mM EDTA instead of 10 mM MgCl2 was used. For the separation of the high salt-extracted lysates, SEC buffer containing 0.5 M NaCl instead of 60 mM NaCl was used. For the comparison of the polysome profile from the cells treated either with, or without, EDTA or amino acids, 150 μl of cell lysate containing 50 μg of RNA from each sample was injected. For the separation of polysomes from liver tissue, 180 μl of tissue lysate containing 150 μg of RNA was injected for the check of reproducibility and 200 μl of tissue lysate containing 2 mg of protein was injected and separated with SEC buffer not containing heparin for the proteomic analysis. The chromatogram was monitored by measuring UV absorbance at 215, 260 and 280 nm with 1 Hz of data collection rate by the Diode Array Detector. The flow rate was 0.8 ml/min and either 48 × 100 μl fractions, 24 × 200 μl fractions or 16 × 300 μl fractions were collected from 9 min to 14.6 min using a low-protein binding 96-deep-well plate 1 mL (Eppendorf) at 4°C. The peaks were quantified using the Chromeleon 6.8 Chromatography Data System (Thermo Fisher Scientific). Proteins in each fraction were precipitated with 10% trichloroacetic acid (TCA) and 10 μg of BSA for western blotting. Preparation for the proteomic analysis was described below. RNAs in each fraction were extracted either by TRIzol LS reagent, or by treating the samples with 0.1 mg/ml proteinase K, 1% SDS and 15 mM EDTA for 1 hr at 42°C followed by phenol-chloroform extraction, and precipitated with isopropanol containing 5 μl of 0.25% linear acrylamide. For the column cleanup, after flushing water for at least 10 CV at room temperature, the column was first filled with the pepsin solution (20 μg/ml pepsin, 0.1 M acetic acid, 0.5 M NaCl) by running for at least 6 CV and incubated for 1 hr at 37°C without flow. Next, the RNase A solution (20 μg/ml RNase A, 10 mM Tris-HCl (pH 7.4), 0.5 M NaCl) was filled as above and the column was incubated for 1 hr at 37°C without flow. Then, the column was flushed by 1% SDS, 2 x SSC (0.3 M NaCl, 30 mM trisodium citrate dehydrate) solution for 10 CV at 50°C. After rinsing with 10 CV dH2O at room temperature, the column was equilibrated with the SEC buffer. Proteins in each fraction were reduced and alkylated with TCEP and NEM then were cleaned up using the SP3 method (Hughes et al., 2014) and ‘on-beads’ digestion to peptides performed using trypsin, added at a ratio of 1:50 by weight, based upon an EZQ protein assay of the fractions, then incubated for 18 hr at 37°C. Peptides were then recovered by SP3 and further purified with SDB-RPS Stagetips (Rappsilber et al., 2007). SDB-RPS StageTips were generated by punching double-stacked SDB-RPS discs (Sigma, Cat#66886 U) with an 18-gauge needle and mounted in 200 μl tips (Eppendorf). Each tip was wetted with 100 μL of 100% acetonitrile and centrifuged at 1,000 x g for 1 min. Following wetting, each StageTip was equilibrated with 100 μL of 30% methanol/1% TFA and 0.1% TFA in H2O, with centrifugation for each at 1,000 x g for 3 min. Each StageTip was then loaded with the equivalent of ~5 μg peptide in 1% TFA and centrifuged as above. The peptides were washed once with 100 μl of 0.2% TFA in water, which was followed by one wash with 100 μl of 99% isopropanol/1% TFA with and centrifuged after each step as above. To elute, 100 μL of 5% ammonium hydroxide/80% acetonitrile was added to each tip and centrifuged as above for 5 min. Eluted peptides were dried using a GeneVac EZ-2 using the ammonia setting at 35°C for 1 hr. Dried peptides were resuspended in 20 μL of 5% formic acid and stored at 4°C until analysed by LC-MS. Peptide concentrations were determined using a CBQCA assay. Peptides were analyzed by a Dionex RSLCnano HPLC-coupled Q-Exactive Plus mass spectrometer (Thermo Fisher Scientific). Using a Thermo Fisher Dionex RSLCnano UHPLC, peptides in 5% (vol/vol) formic acid (injection volume 3 μL) were directly injected onto a 45 cm x 75 um C18 (Dr. Maisch, Ammerbuch, Germany, 1.9 μm) fused silica analytical column with a ~10 μm pulled tip, coupled online to a nanospray ESI source. Peptides were resolved over gradient from 5% acetonitrile to 40% acetonitrile over 60 min with a flow rate of 300 nL min−1. Peptides were ionized by electrospray ionization at 2.3 kV. Tandem mass spectrometry analysis was carried out on a Q-Exactive Plus mass spectrometer using HCD fragmentation. The data-dependent acquisition method used acquired MS/MS spectra on the top 30 most abundant ions at any one point during the gradient. Briefly, the primary mass spectrometry scan (MS1) was performed in the Orbitrap at 70,000 resolution. Then, the top 30 most abundant m/z signals were chosen from the MS1 for collision-induced dissociation in the HCD cell and MS2 analysis in the Orbitrap at 17,500 resolution. Precursor ion charge state screening was enabled and all unassigned charge state, or single charge, were rejected. The RAW data produced by the mass spectrometer were analyzed using the MaxQuant quantitative software package (Version 1.5.1.3) (Cox and Mann, 2008). This version of MaxQuant includes an integrated search engine, Andromeda (Cox et al., 2011). Peptide and Protein level identification were both set to a false discovery rate of 1% using a target-decoy based strategy. The database supplied to the search engine for peptide identifications was the Mouse Swissprot database. The mass tolerance was set to 4.5 ppm for precursor ions and MS/MS mass tolerance was set at 20 ppm. Enzyme was set to trypsin (cleavage C-terminal to lysine and arginine) with up to two missed cleavages. Deamidation of Asn and Gln, oxidation of Met, pyro-Glu (with peptide N-term Gln), protein N-terminal acetylation were set as variable modifications. N-ethylmaleimide on Cys was searched as a fixed modification. The output from MaxQuant provided peptide level data as well as protein group level data. We used the protein groups as defined by the Maxquant package. iBAQ (Intensity Based Absolute Quantification) algorithm in MaxQuant was used for protein quantitation. All the RAW MS data have been deposited to the ProteomeXchange Consortium via the PRIDE partner repository with the data set identifier PXD008913. The MaxQuant output has also been uploaded to the ProteomeXchange Consortium under the same identifier given above. MaxQuant output was analyzed in RStudio v1.0.136 with R language (version 3.3.2). The iBAQ intensity profile for each replicate was smoothed using a three-fraction sliding mean and the minima and maxima of each profile was normalized within the limits 0 and 1, respectively. The mean and range for each protein, across two biological replicates, was calculated for subsequent plotting using the ggplot2 package (http://ggplot2.org/), correlation analysis, and basic clustering. Proteins labeled as either contaminants, or reverse hits, were removed from the analysis. The mean profiles for each protein were hierarchically clustered. The basic hierarchical clustering was performed using the Euclidean distance measurement and a ‘complete’ agglomeration method. The tree calculated for each data set was cut to generate clusters with a mean Pearson correlation coefficient of 0.95. Proteins were separated by SDS-PAGE and electrophoretically transferred to a PVDF membrane. The membrane was blocked with 3% non-fat dried skim milk in TBS containing 0.1% (w/v) Tween 20 (TBST) for 1 hr at room temperature, washed twice with TBST for 5 min and incubated with the appropriate primary antibody, using IMMUNO SHOT, at 4°C overnight. After washing three times 10 min with TBST, the membranes were incubated with a secondary antibody, conjugated with horseradish peroxidase (HRP), using IMMUNO SHOT for 1 hr at room temperature and then washed a further three times 10 min with TBST. Chemiluminescent-stained proteins were detected by LAS4000 image analyzer (Fujifilm). The antibody sources and dilution ratios used for western blotting in this study were as follows: rabbit polyclonal anti-RPS10 (Abcam, ab151550; 1:3,000), goat polyclonal anti-RPL28 (A-16) (Santa Cruz Biotechnology, sc-14151; 1:500), rabbit polyclonal anti-RPL14 (Bethyl, A305-052A; 1:5,000), mouse polyclonal anti-RPLP0 antibody (Abcam, ab88872; 1:2,000), HRP-conjugated anti-mouse IgG (Cell Signaling Technology, #7076; 1:10,000), HRP-conjugated anti-rabbit IgG (Cell Signaling Technology, #7074; 1:10,000), HRP-conjugated anti-goat IgG (Sigma, A5420; 1:10,000). In vitro puromycylation was performed as previously reported with a slight modification (Aviner et al., 2013; Aviner et al., 2014). Each fraction separated by SEC was equally divided into two and 100 pmol of puromycin was added to the one and 100 pmol of Biotin-dC-puromycin was added to the other. After incubation for 15 min at 37°C, the samples were precipitated by TCA, separated by SDS-PAGE and transferred to a PVDF membrane. The membrane was blocked with 3% non-fat dried skimmed milk in TBST for 1 hr at room temperature, washed with TBST for 10 min twice, and incubated with HRP-conjugated streptavidin in TBST for 15 min at room temperature. After washing 3 × 10 min with TBST, biotin-puromycin conjugated nascent polypeptide chains were detected using a LAS4000 image analyzer. Northern blotting was performed as previously reported with a slight modification (Yoshikawa et al., 2015). Briefly, RNAs were electrophoresed on a 1% agarose gel including 1.2% formaldehyde and 1 x TT buffer (Mansour and Pestov, 2013; Preti et al., 2013) and transferred to a Hybond-N+ nylon membrane, which was subsequently dried and then UV cross-linked. After staining with methylene blue, RNAs were hybridized, either to biotin-labeled DNA oligonucleotide probes at 50°C, or to biotin-labeled oligo dT probe (iba) at 42°C, overnight in PerfectHyb Plus hybridization buffer (Sigma). The hybridized membrane was washed sequentially with 2 x SSC containing 0.1% SDS for 5 min at room temperature, 0.5 x SSC containing 0.1% SDS for 20 min at 50°C or 42°C and 0.1 x SSC containing 0.1% SDS for 20 min at room temperature. The hybridized RNA was detected using a Chemiluminescent Nucleic Acid Detection Module kit and a LAS4000 image analyzer. The sequences of oligonucleotides used as probe were follows: for ACTB mRNA, 5'-CTCCTTAATGTCACGCACGAT-3'; for RPL23a mRNA, 5'- GTTGACCTTGGCCACATCAATGTC-3'; for 18S rRNA, 5’- GGCGACTACCATCGAAAGTTGATAG −3’; for 28S rRNA, 5’- TTCGGAGGGAACCAGCTACTAGAT −3’. 3’-end biotin-labeled oligonucleotides were synthesized by Eurofins Genomics. SDG analysis was performed as previously reported with a slight modification (Ishikawa et al., 2017; Strezoska et al., 2000). Briefly, the supernatants containing 100 or 200 μg RNAs in 500 μl, prepared as above, were layered on 10 ml of 10%–45% (wt/wt) SDGs in 20 mM Hepes-NaOH (pH 7.4), 60 mM NaCl, 10 mM MgCl2, 1 mM DTT and 0.1 mg/ml heparin, which were prepared by a simple-diffusion-based method (Pestov et al., 2008), then centrifuged at 36,000 rpm for 3 hr at 4°C in a Beckman SW41Ti rotor. The samples were fractionated into 21 fractions (each ~500 μl) using Density Gradient Fractionation Systems (TELEDYNE ISCO), with continuous measurement of the absorbance at 254 nm. Proteins and RNAs in each fraction were extracted as described above. Samples were negatively stained with 2% uranyl acetate. In a typical experiment, a freshly glow discharged carbon coated grid was first soaked on a 5 μl drop of respective sample for 3 min, excess solvent removed and quickly stained with uranyl acetate for 1 min. Subsequently, the grid was washed four times with a 5 μl water drop to remove any excessive stain and air dried. The grid was then mounted on a JEOL side entry room temperature probe and loaded on to the electron microscope for subsequent viewing and imaging, using a JEOL 2010F with FEG (Field Emission Gun) electron microscope operating at 200kV. The imaging was carried out in TEM mode at a nominal magnification of 40,000X and the micrographs were recorded on a 4K × 4K Gatan CCD camera. To analyze reproducibility between replicates, either the UV absorbance at 260 nm between the times indicated for each replicate for SEC profiles, or the UV absorbance at 254 nm between the times indicated for each replicate for SDG profiles, was correlated between replicates. Image Studio Lite Ver 5.2 (LICOR) was used to quantify the band intensity. The standard deviation for the three biological replicates was calculated and used to provide either standard error bars on the graphs, or error ribbons on the UV chromatograms. An unpaired t-test was used to decide significant differences. Journal of Biological Chemistry 279:13522–13531. Journal of Biological Chemistry 288:29530–29538. Journal of Visualized Experiments 87:e51455. Journal of Molecular Biology 18:356–371. Briefings in Functional Genomics 15:22–31. Molecular & Cellular Proteomics 14:1989–2001. Molecular & Cellular Proteomics 15:2476–2490. The Journal of Biological Chemistry 245:1504–1506. Nature Structural & Molecular Biology 19:560–567. European Journal of Biochemistry 9:445–450. European Journal of Biochemistry 15:464–471. Current Protocols in Cell Biology 39:22.11.1–22.1122. 305–321, Analysis of Ribosome Loading onto mRNA Species, mRNA Formation and Function, New York, Academic Press, 10.1016/B978-012587545-5/50017-3. Molecular and Cellular Biology 27:6639–6646. Journal of Biological Chemistry 286:27927–27935. The Journal of Cell Biology 106:545–556. Molecular and Cellular Biology 20:5516–5528. Molecular Biology of the Cell 27:2642–2652. The Journal of Cell Biology 208:581–596. Trends in Biochemical Sciences 27:376–380. Thank you for submitting your work entitled "Ribo Mega-SEC Provides Efficient and Reproducible Analysis of Polysomes and Ribosomal Subunits" for consideration by eLife. Your article has been reviewed by three peer reviewers, including a member of our Board of Reviewing Editors, and the evaluation has been overseen by a Senior Editor. The following individual involved in review of your submission has agreed to reveal their identity: Leos Shivaya Valasek (Reviewer #3). This study describes the use of HPLC size exclusion chromatography to resolve polysomes from monosomes and free subunits in whole cell extracts. The technique (referred to here as RM-SEC) appears to have several advantages over sucrose density gradient centrifugation (SDGC), such as greater rapidity and (possibly) reproducibility, and fractionation in physiological buffers versus sucrose. They present evidence that the technique gives reproducible separations consistent with SDGC, with the exception that the 80S (monosome) peak is dramatically reduced in this technique. They favor the idea that the 80S peak is overemphasized in SDGC at least partly due to artefactual dissociation of polysomes into 80S monosomes during centrifugation. Summary of critique: All three reviewers agreed RM-SEC could be a valuable addition to translation research, at least for its rapidity and amenability to high-throughput applications, and for the absence of high concentrations of sucrose for downstream cryo-EM applications. However, all three also voiced serious concerns with the quality of the data and interpretations of certain results. It was agreed that the inability to resolve different n-mer polysomes from one another is an important drawback of the technique that the authors should attempt to resolve. The very minimal 80S peak is also troubling and it was felt that further work is needed to illuminate the dramatic difference between RM-SEC and SDGC in terms of 80S abundance, as this will be crucial to the acceptance of RM-SEC by the translation field. In this regard, it was felt that you should attempt to demonstrate that RM-SEC will detect an extensive conversion of polysomes to inititation-arrested 80S monosomes engendered by Harringtonin, and to compare the high-salt sensitivity of the 80S peaks in SDGC vs RM-SEC. It is also important to present evidence supporting your assertion that a substantial fraction of polysomes dissociate into 80S monosomes during SDGC, as this calls into question a large body of work in the field based on SDGC, starting with the presentation of your own data from an experiment in which polysomes isolated by RM-SEC were resolved by SDGC. In addition, the SDGC separation in Figure 1—figure supplement 2, used to assign ribosomal species in RM-SEC is of poor quality, which seemed likely to have overemphasized contamination of the 80S peak with free 60S subunits using SDGC, and would have to be improved. Another drawback is working with cells in which the polysome content is very low, and it was felt that you should examine rapidly growing yeast extracts to remedy this problem-especially considering the importance of yeast as a model system for elucidating translation mechanisms. There are also numerous issues with inexplicable results from the analysis of rRNA and ribosomal proteins across the RM-SEC fractions, including: (i) in Figure 1B-EDTA-treated lysate, fraction 8 (40S peak) contains a considerable amount of 18S rRNA but no RPS10. (ii) In Figure 1—figure supplement 5-EDTA-treated lysate, fraction 3 (40S) contains no 28S rRNA but a lot of RPLP0. (iii) In Figure 1—figure supplement 5, there is no peak of Rps10 or 18S rRNA in the 80S peak in fraction 6. And in Figure 3C, the redistribution of ACTB mRNA from polysomes to monosomes appears to be nearly as dramatic as that seen for uL23 mRNA, necessitating quantification of these mRNA distributions from replicates. The discrepancy between the results in Figure 4 and those published by Gao et al., 2015 could be explored further by comparing in your their own hands the results obtained using SDGC and RM-SEC; although this would not be considered essential for acceptance. Finally, it is necessary to substantiate your claim that the results of SDGC are less reproducible than from RM-SEC. In view of the many criticisms and requests for additional experiments, the paper must be rejected at this stage. However, in view of the strong potential of this technique for improving the analysis and quantification of polysome distributions, all three reviewers would be willing to serve as referees again to evaluate a new submission containing considerable new experimental work that addresses all of the major issues noted above. This study describes the use of HPLC size exclusion chromatography to resolve polysomes from monosomes and free subunits. It appears to have several advantages over sucrose density gradient centrifugation (SDGC), such as greater rapidity and reproducibility, and fractionation in physiological buffers versus sucrose. They present evidence that the technique gives reproducible separations consistent with SDGC, with the exception that the 80S (monosome) peak is dramatically reduced in this technique. They favor the idea that the 80S peak is overemphasized in SDGC at least partly due to artefactual dissociation of polysomes into 80S monosomes during centrifugation. This appears to be a very significant technological advance for the translation field. However, questions surrounding the 80S monosome peak could hinder workers from embracing it as an alternative to SDGC, since determining polysome:monosome ratios as a measure of translational activity is frequently a goal of these experiments. As such, the authors should be asked to substantiate their interpretation by presenting the data cited but not shown for the experiment they describe in the Results and Discussion in which the polysome fraction isolated from HPLC was resolved by SDGC. According to their explanation, the HPLC-polysome fraction should yield a substantial proportion of 80S monosomes when separated in SDGC. In view of recent findings from Heyer and Moore that a large fraction of the monosomes are involved in translation elongation, it seems possible that the vacant 80S couples unbound to mRNA thought to constitute a significant fraction of the 80S peak in SDGC dissociate into free subunits in the HPLC separation. If so, essentially all of the small 80S peak resolved by HPLC would be comprised of translating 80S ribosomes and hence, resistant to high salt; whereas the a substantial proportion of the 80S peak in SDGC is known to dissociate in high-salt owing to the presence of vacant 80S couples. It seems incumbent on the authors to examine this question by comparing the amount of monosomes present in HPLC versus SDGC separations in high salt conditions where vacant couples dissociate into free subunits. 1) It is striking that the 80S peak is almost invisible in most SEC profiles compared to sucrose gradients. Further, in Figure 1—figure supplement 2 each sucrose gradient peak/fraction from U2OS cells is resolved by SEC, and considerable cross-contamination of 60S and 80S subunits is found. For example, the 80S peak in sucrose gradients is found to contain more 60S than 80S by SEC. This is important. Researchers working on translational control and ribosome biogenesis have made conclusions based on the identity of peaks in sucrose gradients, an identity that has been supported by the use of translation inhibitors. Are these conclusions now wrong? For this reason, I think it is relevant to ascertain the composition of the peaks by other methods (e.g. throw the peak material onto an electron microscopy grid to visualize 60S versus 80S ribosomes or mixed assemblies). 2) Regarding the issue above, how would profiles in the presence of Harringtonine (which should increase the 80S peak) look like in sucrose gradients compared with SEC? In these conditions, how does the 80S peak from the sucrose gradient appear in SEC? The experiment could be performed using Hela cells for a direct comparison with Figure 1A. 3) The rRNA profiles do not always coincide with the RP profiles. For example, in Figure 1B-EDTA-treated lysate, fraction 8 (40S peak) contains a considerable amount of 18S rRNA but no RPS10. Similarly, in Figure 1—figure supplement 5-EDTA-treated lysate, fraction 3 (40S) contains no 28S rRNA but a lot of RPLP0. In the presented paper, Yoshikawa et al. present Ribo Mega-SEC, a newly developed approach for the separation and biochemical analysis of polysomes and ribosomal subunits using size Exclusion Chromatography and uHPLC. Based on the presented data I agree that it is an interesting alternative technique to the classical SDG, however, I disagree that this method represents a significant improvement of the polysomal analysis in general, mainly with respect to the efficiency, reproducibility and downstream applications. – Resolution of polysomes by Mega-SEC is very poor – they come in one broad peak, in principle also including the monosome, when compared to beautifully separated n-somes by the conventional SDG. – Figure 1—figure supplement 2B; the second (80S) and third (60S) peaks are not resolved well enough; the 80S peak contains a very large amount of 60S subunits and vice versa. – I also disagree with the optimal flow rate and urge the authors to test also a lot slower rates (even 0.5 ml/min is not satisfactory at all); extending the analysis from 15 min to 30 min would still preserve the time-spent advantage but at the same it could dramatically improve the resolution that is a real problem with this technique. – According to my own (rather extensive) experience, the amount of polysomes obtained by SDG by these authors is exceptionally low (see Figure 1–figure supplement 2A and 5). It almost looks like a very efficient polysomal run-off, why is that? In Figure 1—figure supplement 5 there is also a surprisingly small peak of 18S and RPS10 in the 80S-containing fractions. – I also disagree that the conventional SDG is troublesome with respect to reproducibility and its usage for downstream applications. – Figure 3C; I see even more dramatic difference in the ACTB distribution here – both fat peaks are gone? – “[…] note that an alternative study, using SDG, reported that polysomes are disassembled in fasted mouse liver (Gao et al., 2015)." I would expect this to be true but one never knows. Nonetheless, this discrepancy may be an important one, worth pursuing further (examining this phenomenon by both techniques in parallel), as its resolution may bring a real advantage of Mega-SEC over SDG into life. In summary, I am not sure what advantage (apart for rough high-throughput screening) this technique may bring to the people planning to analyse polysomes over the SDG technique. For example, the authors should, after the very problematic "resolution issue" has been resolved, analyze the distribution of as many translation factors (eIFs, eEFs and eRFs) as possible across the entire profile under various conditions and show that their distribution changes and that these changes are highly reproducible. This would be a real improvement that would most probably change for example my mind to give the Mega-SEC a try. Thank you for resubmitting your work entitled "Efficient Analysis of Mammalian Polysomes in cells and tissues using Ribo Mega-SEC" for further consideration at eLife. Your revised article has been favorably evaluated by James Manley (Senior Editor), and 3 reviewers, including a member of our Board of Reviewing Editors. The reviewers appreciated the large amount of effort that was expended to address the concerns that were raised with the previous version of the paper, and agree that the paper was considerably strengthened by these efforts. There are, however some remaining issues. First, although the results shown in Figures 1A and C provide strong evidence that the SEC technique is capable of resolving polysomes of different sizes, none of the separations presented in the paper actually show a resolution of the single polysome peak into discrete n-mer peaks in the manner that is routinely achieved by SDGC. Identification of the distribution of the different n-mer polysomes by SDGC provides valuable information about the rate of translation initiation and also is crucial in experiments that seek to identify the number of ribosomes per mRNA on particular mRNAs by determining the distribution of individual mRNAs across the different n-mer species, either by RT-PCR or Northern analysis of particular mRNAs or by microarray or RNA-seq analysis across the fractions. It is felt therefore that if the authors can provide in the results an SEC separation in which different n-mer species can be resolved, even if this requires a significantly longer separation time than achieved with the 0.8ml/min flow rate chosen for most experiments, this would greatly increase the likelihood that this new approach would be widely embraced by the translation field and that this paper would be highly cited in the future. In addition to this experiment, there are a number of other requests for additional data, explanation of certain results, or corrections/clarifications to the text raised by each of the three reviewers that must be addressed in a revised manuscript, as described in the individual reviews. – Results section, paragraph three: cite specific panels of Figure 1 and Figure 1—figure supplement 2 rather than the entire figures to refer to specific results. – Results section, paragraph ten. : Again, cite panels A and B of Figure 3—figure supplement 1 where appropriate rather than just citing the whole figure. Check entire manuscript for proper citations of specific panels of figures throughout. – Results section, paragraph eighteen: shouldn't this cite Figure 6—figure supplement 3A vs 3B? The manuscript has significantly improved. The authors carried out a lot of new valuable experiments that have convinced me this technique can be used as an alternative to the classical SDGC in some – but not all – applications. Nonetheless, I still have many concerns – outlined below – that should be addressed before this paper introducing a novel technique can be accepted for publication. First my personal point of view as a researcher for whom the SDGC represents a daily bread – this is not a critique, just a practical guide into the "supply and demand" issue. "Speed is not all what matters." Truly, I do not see a practical use of Mega-SEC in most of our applications. We work with human as well as yeast cells and what we need is the following. 1) Prepare polysome profiles with nicely resolved polysomes to calculate the P/M ratio and obtain an insight into the fitness of translation as a whole, which the new technique is not able to offer. 2) To study various aspects of the initiation process, we need to clearly resolve the 43-48S pre-initiation complexes (PICs) from the top of the gradient where free factors sediment, as well as from heavier 60S species, to be able to collect 10-12 fractions that we subject to Western blotting to quantitatively analyze the distribution of various initiation factors across the gradient in wt vs. mutant cells (employing Mass-Spec is an interesting idea but it could not be used to quantify changes in the distribution of factors). To achieve this we have to use the 7.5-30% linear sucrose gradient instead of 5-45%. The separation of the 40S species from the lighter material by Mega-SEC does not seem to be sufficient to manage this but perhaps it could if the flow rate was a lot slower? 3) To study various aspects of the termination process, we need to clearly separate heavy from light polysomes and Mega-SEC does not allow any separation at all (they all come as a single peak in 3 fractions). I understand that they are all there and they are stable, as demonstrated, but it does not help. 4) I agree that it could be perhaps used for ribosome profiling but to set-up a brand new method in the lab just because of a single application is probably not worth it. To make a long story short, if the authors managed to adjust the conditions (perhaps by applying a lot slower flow rate) in a way that a nice separation of individual polysomes (equivalent to or even better than SDGC) and of 40S species from the "top" can be achieved, it would win it for me even if it took 1 or 2 h instead of the advertised 15 min. Figure 1: It is interesting to notice that fraction 12 of SDG, containing the 80S-latter half, and fraction 14 of SDG, presumably containing di-somes, show the same profile in SEC (i.e. they seem to be an equilibrated mix of 60S and 80S). Please, discuss how do the authors interpret this. How can the same mix migrate so differently in SDG? Figure 2 and Results paragraph six: Please, add a reference to support the statement that EDTA treatment increases the effective size of ribosomal subunits. On the same lines, does high salt treatment reduce the effective size of ribosomal subunits? It is curious that both EDTA and high salt result in lighter subunits by SDG, yet the behaviour of subunits on SEC is opposite (compare Figure 2A with Figure 3—figure supplement 1). Regarding Figure 2, please show a more exposed gel for RPS10 under EDTA treatment. The protein seems absent from any fraction, and one concludes that it is actually degraded during fractionation. Figure 3: SEC fraction 2 contains polysomes with 4 or more ribosomes, as judged by SDG. This heterogeneity is not observed by EM (EM: b images and Results paragraph nine) where the authors find mainly polysomes of 4 ribosomes. Why? Please, show a Table of all proteins identified in Figure 6 by cluster. Figure 7: The fractionation profile of several of the factors is unusual: i) No PABPC1 is found in free RNPs ("smaller complexes"); ii) No EEF2 is present in polysomes; iii) No EJC is found in free RNPs. For all these factors, judging from their functions and their fractionation in SDG, one would expect a different profile. Please discuss, or better provide a parallel analysis of this tissue in SDG. Summary of critique: All three reviewers agreed RM-SEC could be a valuable addition to translation research, at least for its rapidity and amenability to high-throughput applications, and for the absence of high concentrations of sucrose for downstream cryo-EM applications. We thank the reviewers for these positive remarks, which highlight the potential value of our new method. We would like to stress that in addition to its potential value for studying translation per se, we believe that it also will be very useful for a wider range of applications studying gene regulation and physiological response mechanisms in cells and tissues that alter the sets of proteins being actively translated. To strengthen the new RM-SEC method, we have now added a considerable amount of additional new data to the revised manuscript, including data showing both EM analysis and MS-based proteomic analysis on the fractionated polysomes. However, all three also voiced serious concerns with the quality of the data and interpretations of certain results. It was agreed that the inability to resolve different n-mer polysomes from one another is an important drawback of the technique that the authors should attempt to resolve. We have addressed this important issue of polysome resolution directly in the revised manuscript, providing additional experimental verification of our method. In essence, we demonstrate clearly that the SEC approach is a flexible method that can either be used to separate different size classes of polysomes quickly with higher resolution, or to provide even faster isolation of polysomes (i.e. ~ 10 mins) with lower resolution separation of different size classes of polysomes, depending upon the needs of individual experiments. We show that the degree of resolution obtained is a function of SEC flow rate and elution time. We also show clearly in the revised manuscript that the polysomes isolated by SEC are stable, as well as functional, and that they can thus readily be purified with high resolution using 2 sequential rounds of SEC, which can still be achieved within a total analysis time of 30-40 mins, which is substantially faster than a single round of SDGC analysis. Therefore, researchers addressing different experimental questions can benefit from the increased speed and reproducibility of using uHPLC-based fractionation combined with SEC. We have also included new data from EM and proteomic characterisation of the isolated polysomes, demonstrating the advantages of rapid isolation of polysomes in buffers suitable for immediate downstream analysis (new Figure 3). Finally, we have revised the Discussion section to present a more detailed, objective review of the ability of the respective methods to distinguish different size classes of polysomes and how this relates to different experimental applications. We have tried to present a balanced view highlighting objectively the pros and cons of the SEC as well as the SDGC method. The very minimal 80S peak is also troubling and it was felt that further work is needed to illuminate the dramatic difference between RM-SEC and SDGC in terms of 80S abundance, as this will be crucial to the acceptance of RM-SEC by the translation field. In this regard, it was felt that you should attempt to demonstrate that RM-SEC will detect an extensive conversion of polysomes to inititation-arrested 80S monosomes engendered by Harringtonin, and to compare the high-salt sensitivity of the 80S peaks in SDGC vs RM-SEC. We have addressed this in the revised manuscript and compared the preparation of HeLa cell lysates using either Triton X-100, or CHAPS as a solubilising detergent (please see our explanation on using CHAPS from line 96). We found no changes in terms of overall polysome profiles examined by SDGC, which shows a similar high fraction of ribosomes in polysomes, as opposed to 80S monosomes (Figure 1—figure supplement 1). We therefore conclude that the relatively low abundance of the 80S peak, compared with the polysome peak, is not specific to the SEC analysis method but rather is characteristic of the translation profile for the HeLa cells and culture conditions used. It may be that under conditions of rapid cell growth there is a high polysome to monosome ratio (Figure 1—figure supplement 1), although we note that this is also seen in mouse liver tissue and may therefore be a more general feature of many mammalian cells. Moreover, as shown in Figure 5 in the revised manuscript (Figure 3 in the original manuscript), we clearly detect higher ratios of 80S monosomes to polysomes when the same HeLa cells are grown under conditions of amino acid starvation. We therefore are confident that the data support the view that mammalian cells will typically have a high polysome ratio and that this is not caused by a detection problem associated with the SEC method. We have also analyzed the ‘high-salt’ sensitivity of the 80S peak in SDGC and RM-SEC as requested by reviewers. It is known that the separation in SEC is sensitive to changes in mobile phase components, such as salts, and therefore, as shown in revised Figure 3—figure supplement 1, the resolution of each peak changes with extracts in high salt concentration. We therefore would view the RM-SEC method as not well suited for addressing the specific issue of the ‘vacant 80S couple’. It can however still be used to isolate polysomes from extracts prepared in high salt concentration. We have discussed these specific issues clearly and highlighted the pros and cons of the respective methods in the revised Discussion. It is also important to present evidence supporting your assertion that a substantial fraction of polysomes dissociate into 80S monosomes during SDGC, as this calls into question a large body of work in the field based on SDGC, starting with the presentation of your own data from an experiment in which polysomes isolated by RM-SEC were resolved by SDGC. We examined the possibility raised in the discussion in our original manuscript carefully and found no dissociation of polysomes into 80S monosomes (Figure 3B). We have added the data showing this and have therefore revised the text and discussion accordingly. In addition, the SDGC separation in Figure 1—figure supplement 2, used to assign ribosomal species in RM-SEC is of poor quality, which seemed likely to have overemphasized contamination of the 80S peak with free 60S subunits using SDGC, and would have to be improved. To address this, we have re-analyzed the polysome profile from HeLa cell extracts and present these new data in a revised Figure 1. This allows us to assign more accurately the profiles for the elution of the different ribosomal particles fractionated by RM-SEC. We collected 22 SDGC fractions in total, i.e. almost twice as many fractions as analysed in the original manuscript, thereby providing higher resolution. To focus on the 80S species, we took 2 fractions containing 80S (Fractions #11 and 12) and showed that even in the latter half of the 80S peak (Fraction #12), it contained a portion of free 60S subunits. Our findings here therefore are consistent with the previously described resolution issues encountered by other researchers using SDGC, for example see the paper describing Ribosome Profiling (Ingolia NT et al., 2009). Another drawback is working with cells in which the polysome content is very low, and it was felt that you should examine rapidly growing yeast extracts to remedy this problem-especially considering the importance of yeast as a model system for elucidating translation mechanisms. As mentioned above, we re-analyzed HeLa cell extracts by SDGC (new Figure 1—figure supplement 1), using the same cell growth conditions that we used throughout the experiments in this manuscript. These data from SDGC analyses clearly show that there is a high polysome content in the cells we have studied. We have focused our studies here on developing methods for the analysis of mammalian polysomes/ribosomes, which is our main area of expertise and research interest. We have therefore revised the title and the text with emphasis on the separation of mammalian polysomes/ribosomes by RM-SEC. We fully acknowledge the potential importance of also using yeast as a model system for studies on translation regulation, as raised by the reviewers. We have therefore initiated studies on yeast extracts also, but feel strongly that this is best reported in a separate future study. Our pilot studies show that considerable additional work is required to optimise the specific combination of column pore size, flow conditions, salt/detergent etc. in the extracts to provide similar resolution to that we have already optimised here for the mammalian system. As we are not yeast biologists, we would welcome the opportunity to pursue this in future in collaboration with colleagues studying relevant research questions in the yeast system who can benefit from using the SEC approach. Similarly, we are interested to evaluate the application of RM-SEC to analyse also nematode and Drosophila extracts. Meanwhile, we feel that the present manuscript will already be of direct value to the many groups interested in studying polysomes and gene regulatory responses in human and/or mammalian model organisms. There are also numerous issues with inexplicable results from the analysis of rRNA and ribosomal proteins across the RM-SEC fractions, including: (i) in Figure 1b-EDTA-treated lysate, fraction 8 (40S peak) contains a considerable amount of 18S rRNA but no RPS10. To address this, we have performed further experiments, adding additional Western blotting data to the revised manuscript using the anti-RPS10 antibody to probe all of the SEC fractions. This shows that RPS10 is dissociated from the 40S subunit to smaller protein complexes after EDTA treatment (Figure 2—figure supplement 2). These data from SEC analysis are consistent with similar observations we obtained by parallel SDGC analysis (revised Figure 2—figure supplement 1). We have now included these data in the revised manuscript. ii) in Figure 1—figure supplement 5-EDTA-treated lysate, fraction 3 (40S) contains no 28S rRNA but a lot of RPLP0. (iii) in Figure 1—figure supplement 5, there is no peak of Rps10 or 18S rRNA in the 80S peak in fraction 6. To address this, we have re-analyzed the polysome profiles by Western and northern blotting, using HeLa cell lysates +/- EDTA treatment. This shows by SDGC analysis that one of the RPL proteins, RPL14, is mainly detected in the dissociated 60S particle fractions after EDTA treatment (revised Figure 2—figure supplement 1), and also shows that RPS10 and 18S rRNA are both detected in the 80S peak, (revised Figure 2—figure supplement 1). However, as discussed above, under the cell growth conditions used, the total amount of 80S is relatively low compared with the polysome fractions. And in Figure 3C, the redistribution of ACTB mRNA from polysomes to monosomes appears to be nearly as dramatic as that seen for uL23 mRNA, necessitating quantification of these mRNA distributions from replicates. We have now quantitated the mRNA signals and added these data in the revised Figure 5. The discrepancy between the results in Figure 4 and those published by Gao et al., 2015 could be explored further by comparing in your their own hands the results obtained using SDGC and RM-SEC; although this would not be considered essential for acceptance. We have deleted the data shown as Figure 4 in the original manuscript and replaced this figure with the new data we have obtained, derived from analysis of the fed mouse liver only. We have also now added data showing direct, MS-based proteomic analysis of fractions separated by RM-SEC using the fed mouse liver. These new data are presented and described in revised Figure 6 and 7. Finally, it is necessary to substantiate your claim that the results of SDGC are less reproducible than from RM-SEC. To address this, we have performed a detailed analysis of replicate SDGC and SEC profiles and calculated Pearson correlation coefficients to compare the reproducibility from these respective RM-SEC and SDGC analyses. These data are now included in revised Figure 4. We have also revised the text to provide a balanced discussion of the factors that can potentially affect the reproducibility of SDGC profiles. This appears to be a very significant technological advance for the translation field. We thank the reviewer for these positive comments on RM-SEC. We believe that our RM-SEC will be useful as a technical alternative to the conventional SDGC in terms of rapidity, efficiency, reproducibility and biological aspects. However, questions surrounding the 80S monosome peak could hinder workers from embracing it as an alternative to SDGC, since determining polysome:monosome ratios as a measure of translational activity is frequently a goal of these experiments. As such, the authors should be asked to substantiate their interpretation by presenting the data cited but not shown for the experiment they describe in the Results and Discussion in which the polysome fraction isolated from HPLC was resolved by SDGC. According to their explanation, the HPLC-polysome fraction should yield a substantial proportion of 80S monosomes when separated in SDGC. We have calculated the polysome:monosome ratio in revised Figure 5 to show that RM-SEC can be used to provide a measure of translational activity. Moreover, this approach can also be used for polysome profiling to estimate translational efficiency, as a ‘heavy polysome’ fraction is successfully isolated and enriched by RM-SEC (revised Figure 3A, B). 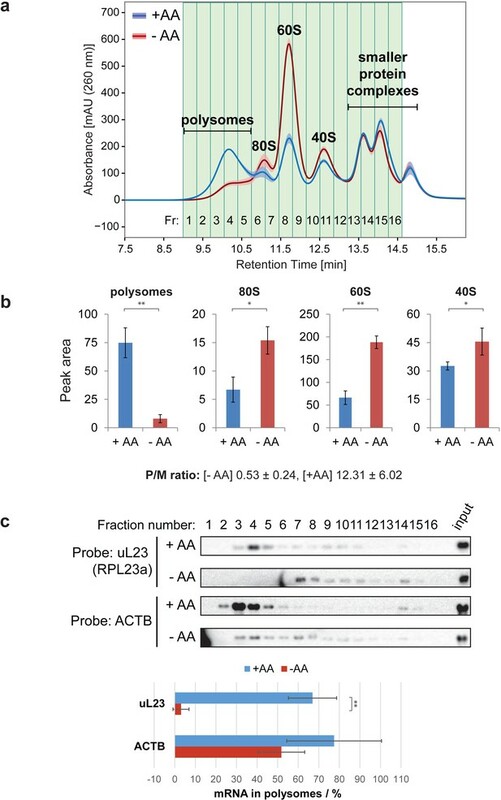 We haven’t detected dissociated ribosomal subunits from polysome fractions when analyzed by SDGC; however, this analysis also shows that the polysomes separated by RM-SEC are stable and intact (revised Figure 3B). Please see our response in ‘Summary of critique’. The manuscript by the Lammond lab on Ribo mega-SEC describes a quick method to separate polysomal complexes, which can be used as an alternative to the more laborious and classical sucrose gradient method. The SEC method is robust and reproducible, and has the potential to become a benchmark for any lab working on translational control. There are some details, however, that need to be clarified. We thank the reviewer for their positive comments on the RM-SEC method. We believe that our RM-SEC will be very useful as an alternative to the conventional SDGC approach for specific types of experiments that can benefit from its rapidity, efficiency and high reproducibility. We have now performed additional experiments to re-evaluate carefully how to assign the respective ribosomal particles fractionated by RM-SEC. To do this we have injected onto the SEC column different fractions isolated from an SDGC gradient. We believe these data are conclusive and show also the degree of cross-contamination of 60S in 80S particles (please see our response in ‘Summary of critique’). We believe that the conversion of polysomes to 80S monosomes is well illustrated already by the experiments we have included comparing extracts isolated from cells grown under conditions of amino acid starvation in Figure 5 in the revised manuscript (Figure 3 in the original manuscript). We thank the reviewer’s comment saying RM-SEC is an interesting alternative technique to the classical SDGC. We also welcome any constructive, objective criticisms on the RM-SEC method that might help us to improve our method/manuscript. To clarify, we had not intended to propose that SDGC should be abandoned, or to suggest that it will not continue to be useful in many areas, or that our new SEC-based approach is the best solution in every situation. No method is without limitations, and few methods, if any, provide the best solution in every experimental situation. For many years there has been essentially no alternative to SDGC for the analysis of polysomes and we contend that our new RM-SEC method now provides a useful alternative that has distinct advantages for many types of experiments, particularly for gene expression studies in mammalian cells and tissues. Rather than replacing SDGC methods, therefore, we anticipate that the RM-SEC approach will in future encourage more researchers to tackle polysome analyses in their projects, who currently do not use SDGC. We have provided here strong, objective arguments based upon reproducible data, which highlight specific advantages provided by the RM-SEC method, including specifically; (1) speed of analysis (2) extremely high reproducibility (3) flexibility and convenience and (4) facilitation of downstream biochemical/structural analyses on the isolated complexes. We believe that we have documented these claims clearly and strengthened them with the additional experiments and data added here to our revised manuscript. We have also reviewed the comments and Discussion presented in the revised manuscript in an effort to present as balanced and objective an overview as possible of the relative pros and cons of both the SDGC and RM-SEC approaches. While we acknowledge that there are prominent groups, experienced in using SDGC as a core part of their studies, who have the expertise and equipment to apply this very effectively, nonetheless, the practical limitations inherent in the SDGC workflow we have experienced have also been widely recognised and commented on previously by many researchers. For example, we will highlight briefly some of the practical issues we and others have experienced when trying to set up and use the SDGC method. Thus, SDGC requires preparation of sucrose density gradients for each analysis, followed by extended ultracentrifugation and then subsequent fraction collection from each gradient by a dedicated fraction collector. Quite apart from access to the specialised equipment for accurately pouring gradients and fractionating them after ultracentrifugation, this is an inherently time-consuming and lengthy set of procedures, each of which introduces a source of technical variation between experiments, as does the preparation of multiple sucrose solutions used to form the gradient. These steps typically involve 5-6 hours (or longer), compared to as little as 15 min for a single shot RM-SEC analysis, using a single mobile phase buffer. In reviewing the literature from different groups using SDGC to analyse polysomes, we have noticed that many papers show significant variation in the detailed profiles presented. This is particularly noticeable in the polysome region, if you focus on the x-axis positions of each polysome peak. It is likely that a number of parameters inherent to the SDGC workflow can contribute to this variation, including differences in gradient formation between centrifugation tubes, differences in starting position and collection of fractions etc. In contrast, the advantage of automated fractionation in uHPLC systems is that each peak is eluted at exactly the same time, across many sequential experiments, which is a major reason for the demonstrably higher reproducibility of SEC separation. Finally, we would again highlight that it is an unavoidable fact that the polysomes fractionated by SDGC are isolated in high sucrose solution. Depending on the experiments being undertaken, this sucrose must then be removed by either dialysis, or other procedures, before the polysomes can be used for many types of subsequent biochemical assays or structural analyses (e.g. Electron Microscopy). The requirement for removal of sucrose thus introduces another source of potential technical variation and another time-consuming step in the workflow. As we show here, in contrast, the RM-SEC method can be performed in a buffer without sucrose that is compatible with immediate assay/analysis (including EM analysis) of the isolated complexes. In summary, therefore, we believe it is simply an objective description of the respective workflows to conclude that RM-SEC offers advantages of speed, reproducibility and ease of carrying out downstream analyses, in comparison with SDGC. We show the profile when separation is performed using a flow rate of 0.2ml/min, which demonstrates that di-somes can indeed be separated. We have revised the text in the revised manuscript to describe more clearly the effect of flow rate on the resolution of complexes. Thank you for pointing this out. – According to my own (rather extensive) experience, the amount of polysomes obtained by SDG by these authors is exceptionally low (see Figure 1—figure supplement 2A and 5). It almost looks like a very efficient polysomal run-off, why is that? In Figure 1—figure supplement 5 there is also a surprisingly small peak of 18S and RPS10 in the 80S-containing fractions. This is a very useful comment and we are grateful to the reviewer for highlighting this point. We have performed more experiments to address this issue, which appears to reflect cell type and growth conditions, rather than separation method. Thus, we have re-analysed the polysome profile by SDGC, using HeLa cells (new Figure 1—figure supplement 1 etc. ), which clearly shows higher levels of polysomes, as also seen in the SEC analyses from the same extracts and in the mouse liver tissue. We have therefore used these new data in the revised manuscript instead of the previous data obtained with U2OS cell extracts used in Figure 1—figure supplement 2A in the original manuscript. Please see our response above and in ‘Summary of critique’. We agree that with experience and practice good results can be obtained also with SDGC and indeed would also see this being a method that may be particularly useful for some specific types of experiments. Nonetheless, we maintain for the reasons explained that RM-SEC can provide a useful alternative approach that also has specific advantages for certain types of experiments. We hope this is now described in a more balanced fashion in the revised manuscript. Please see our response above and in ‘Summary of critique’. As our major focus here is to document the RM-SEC method, we have deleted the result comparing the polysomes from fed and fasted mouse liver in this study. Instead we provide new data describing the MS-based proteomic analysis of fed mouse liver to show the application of RM-SEC. We will investigate the issue of how polysomes are affected by starvation in mouse tissues more comprehensively in a separate future study. We have now significantly extended our characterisation of the RM-SEC method to optimise it for efficient downstream MS-based proteomics analyses on the fractionated complexes and included new data describing such experiments in the revised manuscript. Thus, we present proteomic analysis of all of the fractions separated by RM-SEC using mouse liver tissue across the biological replicates (revised Figure 6 and 7). We have also performed clustering analysis to analyse the fractionated complexes detected by MS and highlighted the identified translation factors, as per the request from the reviewer (revised Figure 6 and 7). We thank the referee for prompting us to include this valuable addition to the manuscript, which helps to illustrate the application of the RM-SEC approach for studies analysing gene expression as well as translation complexes. The reviewers appreciated the large amount of effort that was expended to address the concerns that were raised with the previous version of the paper, and agree that the paper was considerably strengthened by these efforts. There are however some remaining issues. First, although the results shown in Figures 1A and C provide strong evidence that the SEC technique is capable of resolving polysomes of different sizes, none of the separations presented in the paper actually show a resolution of the single polysome peak into discrete n-mer peaks in the manner that is routinely achieved by SDGC. Identification of the distribution of the different n-mer polysomes by SDGC provides valuable information about the rate of translation initiation and also is crucial in experiments that seek to identify the number of ribosomes per mRNA on particular mRNAs by determining the distribution of individual mRNAs across the different n-mer species, either by RT-PCR or Northern analysis of particular mRNAs or by microarray or RNA-seq analysis across the fractions. It is felt therefore that if the authors can provide in the results an SEC separation in which different n-mer species can be resolved, even if this requires a significantly longer separation time than achieved with the 0.8ml/min flow rate chosen for most experiments, this would greatly increase the likelihood that this new approach would be widely embraced by the translation field and that this paper would be highly cited in the future. We share the aspiration that our paper will have a major impact and be highly cited in the future. Indeed, we anticipate that our new methodology will have impact well beyond studies specifically on protein translation mechanisms, because it provides an efficient, reproducible and accessible approach for isolating both polysome complexes and other very large subcellular machineries. This should be of value to researchers working across a wide range of cell and molecular biology fields. We recognise from the reviewers’ comments that there may be specific applications, in particular for detailed mechanistic studies on the protein translation machinery, where it would be useful to distinguish monomer, dimer and higher order polysome complexes. We welcome the opportunity to address this issue directly (raised here and in particular by reviewer #2), and have therefore now included additional new data in our revised manuscript (new Figure 1—figure supplement 3). Our new data demonstrate that we can indeed increase the resolution of separation of polysomes, as well as ribosomal subunits and smaller protein complexes, by fractionating cell extracts on two SEC columns connected in series, performed in a single integrated experiment. We have illustrated this in experiments comparing the use of either two 2,000 Å SEC columns, or a 2,000 Å SEC column combined with a 1,000 Å SEC column, run with a flow rate of 0.2 ml/min. The results are shown in the new Figure 1—figure supplement 3, which shows separation of di-some, tri-some and higher order n-mer species, in a single experiment. With regard to the separation of the 40S species from smaller protein complexes (e.g. which may be relevant for experiments involving the analysis of protein translation initiation complexes), we show that fractionating lysates using a 1,000 Å SEC column provides a high resolution separation between 40S and smaller protein complexes (Figure 1—figure supplement 2). Further increases in the resolution of different translation complexes and polysome species may also be possible if the set-up and flow-rates are adjusted further for specialised applications, but we have not pursued this exhaustively here as we concentrate in this manuscript on illustrating the general application of the methodology. In summary, our new data show that by employing an experimental setup using two SEC columns connected in series in a single shot analysis already provides a nice separation across a very wide range of size classes, ranging from larger polysomes down to smaller protein complexes (Figure 1—figure supplement 3). In the revised manuscript, as well as showing this new figure, we have added a short description of the new data in the Results section and also added further comments to the Discussion section regarding the flexibility this provides to tune the separation of cell and tissue extracts to meet the specific requirements of different experimental applications. We thank reviewer #1 for their positive comments and for pointing out these minor errors. We have now corrected them as suggested. […] To make a long story short, if the authors managed to adjust the conditions (perhaps by applying a lot slower flow rate) in a way that a nice separation of individual polysomes (equivalent to or even better than SDGC) and of 40S species from the "top" can be achieved, it would win it for me even if it took 1 or 2 h instead of the advertised 15 min. We thank the reviewer for their comments and also for providing their perspective on using the Ribo Mega-SEC method as an alternative approach to SDG for studying translation initiation and termination. While we recognise this is helpful, we would hope that reviewer #2 can nonetheless appreciate that our method can also be of value to many other researchers, beyond the mechanisms of translation field, whose requirements and experimental systems are different. For example, while reviewer #2 highlights that in their view/situation, "Speed is not all what matters", we are confident that in many other laboratories, factors such as speed, reproducibility and efficiency will matter. Indeed, this was what led us to develop the Ribo Mega-SEC method. As we describe in the revised manuscript, the Ribo Mega-SEC method is flexible and can be adapted further to optimise its application in a wide range of experimental scenarios. Regarding the P/M ratio, we already show analysis of the P/M ratio in Figure 5 of the previous version of the manuscript, where we monitor the changes in translation before/after amino acid starvation. To expand on this point and illustrate that the Ribo Mega-SEC method can be used to calculate the P/M ratio, we now include an additional new figure in the revised manuscript, showing a profile and P/M ratio using the 0.2 ml/min flow rate (new Figure 1D). The P/M ratio can be calculated readily from the profile obtained using either this slower flow rate of 0.2 ml/min, or using the faster 0.8 ml/min flow rate we find to be suitable for most applications. In addition, we have included in the revised manuscript a new figure (Figure 1—figure supplement 3), as described above in our response to the general comments from the editors, which also addresses this issue. In this new figure we show a higher resolution profile derived from performing separations on two SEC columns connected in series, in a single experiment, using a flow rate of 0.2 ml/min. The manuscript by Yoshikawa and colleagues has significantly improved with the new controls and side-by-side comparison of SEC and SDG. Although the method does not have sufficient resolution to separate n-mer polysomes, it can be useful to quickly separate bulk polysomes from sub-polysomal fractions in a buffer suitable for downstream analysis. We thank the reviewer for their positive remarks and agree that our Ribo Mega-SEC method can be used broadly in the research community. We have not pursued this point experimentally. Our opinion is that the observation most likely reflects the high abundance of the 60S ribosomal subunit. We detect a small portion of the abundant 60S subunit as a cross-contamination across all of the fractions sedimenting faster than 60S. There is also a small cross-contamination of 80S detected together with di-somes in fraction 14. Note that the peak heights of 80S and 60S obtained by injecting fraction 14 onto SEC (Figure 1C) is markedly different to those seen by injecting fraction 12 onto SEC (Figure 1B) and these differences in intensity are consistent between SEC and SDG analyses (Figure 1A). We have added a reference to support this statement as suggested. We have also included discussion of the effect of high salt treatment on separation by SDG and SEC. We have now replaced the image with a longer exposure, as suggested. In addition, we have added an explanation for the number of fractions collected in total (48 fractions, new Figure 2—figure supplement 2). Some fractions were used for Western and northern blotting. We thank referee #3 for pointing this out. We have checked the images taken from SEC fraction 2 and accordingly have replaced the image shown with a more representative example and also revised the text to describe the images more accurately. We have now added a supplementary table listing all of the proteins identified in Figure 6 classified by cluster. We have now added references to support these results and have included discussion of the data. The funders had no role in study design, data collection and interpretation, or the decision to submit the work for publication and therefore the contents of the published material are solely the responsibility of the individual authors and do not reflect the views of the funders. We thank Thermo Fisher Scientific for access to the prototype SEC-2000 LC Columns. We thank the Cowling Lab (University of Dundee) for the use of the SDG fraction collection device. We thank SydneyMS for the provision of mass spectrometry instrumentation used in this study. We thank J Hukelmann and other colleagues in the Lamond laboratory for valuable suggestions. HY has been funded by the Naito Foundation Grant for Overseas, the Uehara Memorial Foundation Postdoctoral Fellowship and is currently supported by the European Union’s Horizon 2020 research and innovation programme under the Marie Sklodowska-Curie Individual Fellowship. ML was funded by the Royal Society of Edinburgh and Scottish Government Personal Research Fellowship and is currently supported by the Cancer Institute NSW Future Research Leader Fellowship. TL is currently supported by the Wellcome Trust and the Royal Society Sir Henry Dale Fellowship. This work is supported by Wellcome Trust grants (073980/Z/03/Z; 105024/Z/14/Z and 098503/E/12/Z), a Wellcome Trust strategic award (097945/B/11/Z), and a National Health and Medical Research Council of Australia (NHMRC) Project Grant GNT1120475. Animal experimentation: All experiments were carried out with the approval of the University of Sydney Animal Ethics Committee (2016/1096), following guidelines issued by the National Health and Medical Research Council of Australia. © 2018, Yoshikawa et al.